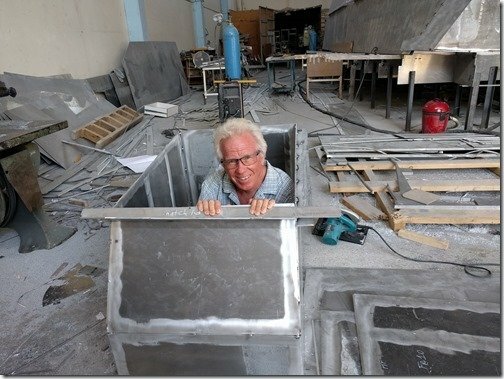 I said FUEL tank not FOOL tank!!! The heat wave continues both weather wise and Möbius progress wise this week and here is your summary of all that has gone on. 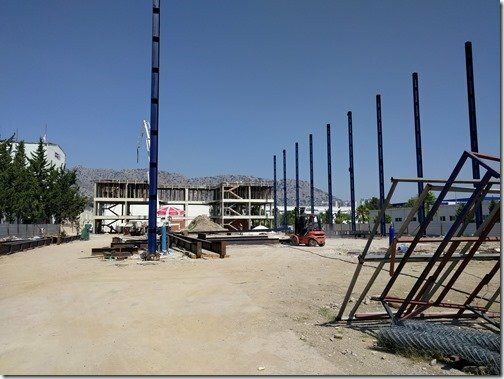 After cooling off slightly last weekend with daytime highs down in the mid to upper 30’s (90’s F) they climbed back up throughout the week and we were up to 41c/106f yesterday. Suffice it to say that we are getting VERY good use out of the lovely big pool we have at our apartment and doesn’t take long to get well cooled. As I sit and type this on Saturday (July 14, 2018) the forecast is for 40-41 high today so I’ll write this in between trips down to the pool if you don’t mind. 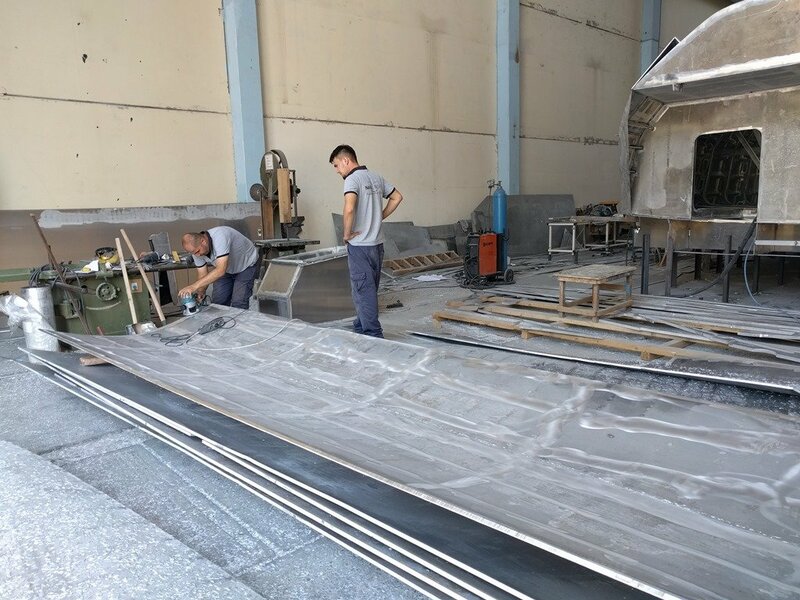 Fortunately there are shower facilities for everyone inside the Naval Yachts shipyard so most of the team is able to cool off and clean up at the end of a hot day which helps make it all quite workable and this is very typical weather for July and August here in Antalya so they are all quite used to it. 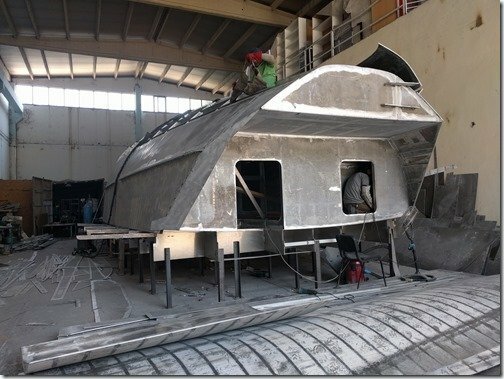 Undeterred by the weather everyone on Team Möbius just kept on going and more great progress was made throughout the week and just before I dive in with all the photos, if you check the daily count meter at the bottom of the blog you will notice that today is the 100th day since construction on the hull began. 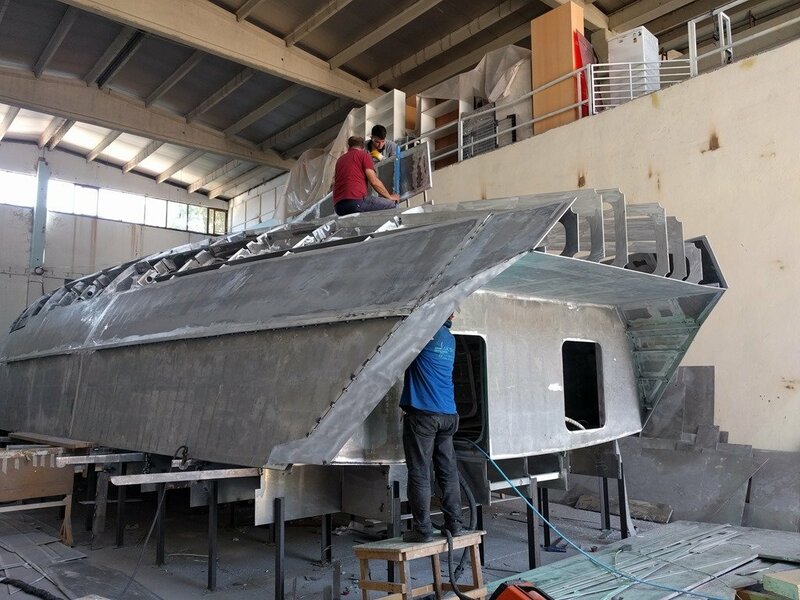 We could not be more pleased with the progress and the results from this incredible team which Naval Yachts as surrounded us with. Now, on with the show! 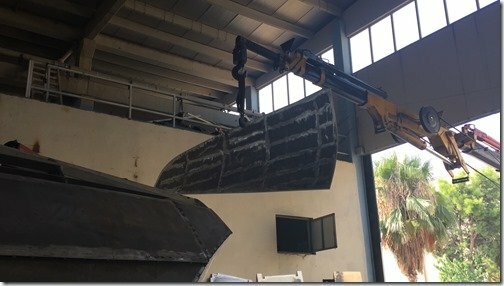 Let’s get the title’s fuelishness out of the way first with my way of showing you the beginning of building our Day Tank. 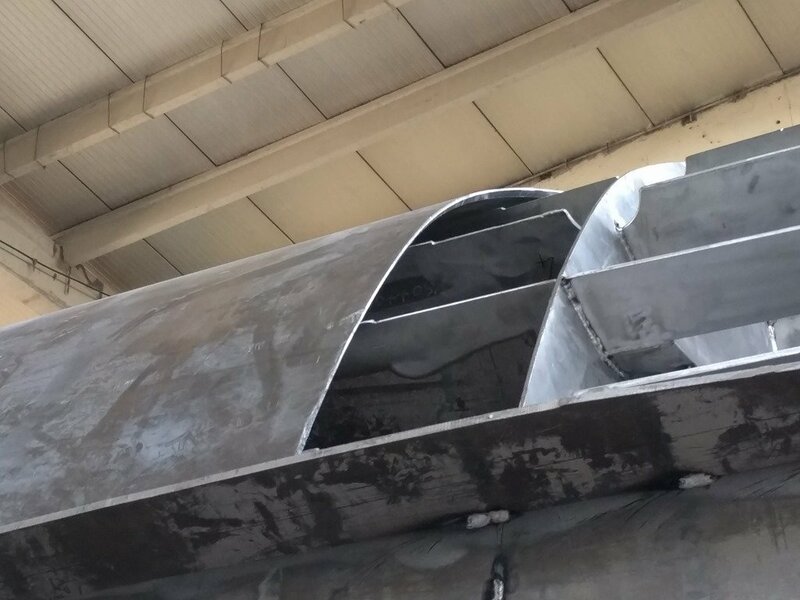 It is called a Day Tank because this is the tank which holds the daily diesel supply Mr. G (our Gardner 6LXB engine) needs when we are underway. Word of Warning; this fool will pop up again in the video at the end of this post! 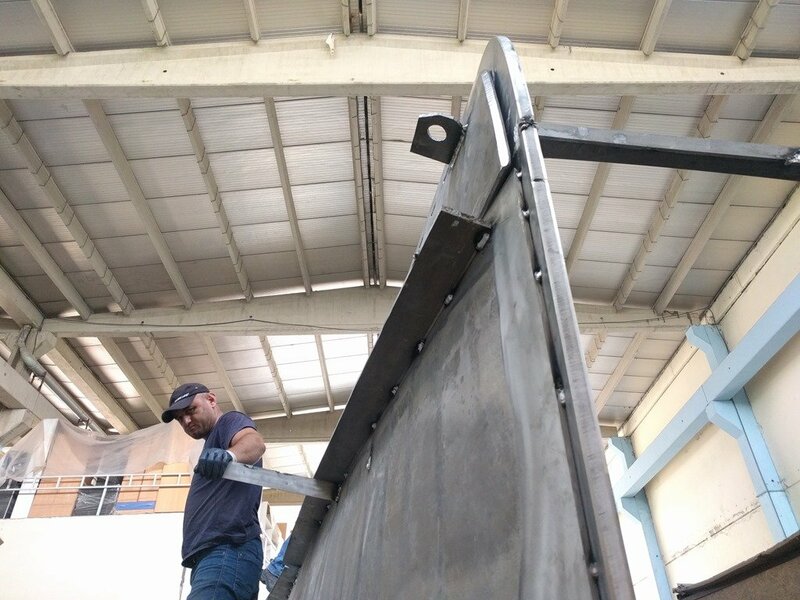 As you’ve been seeing in previous posts, the rest of our tanks are all below the waterline and integrally built into the framework of the hull for added safety and keeping all that weight down as low as possible. 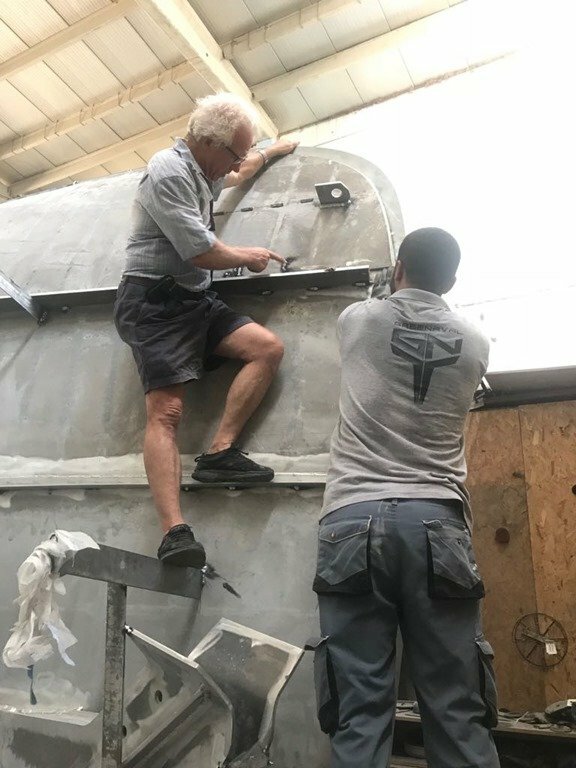 These lower integral tanks hold about 14,000 litres/3700 USGals and each day we will fill up the Day Tank by pulling diesel from those big tanks. 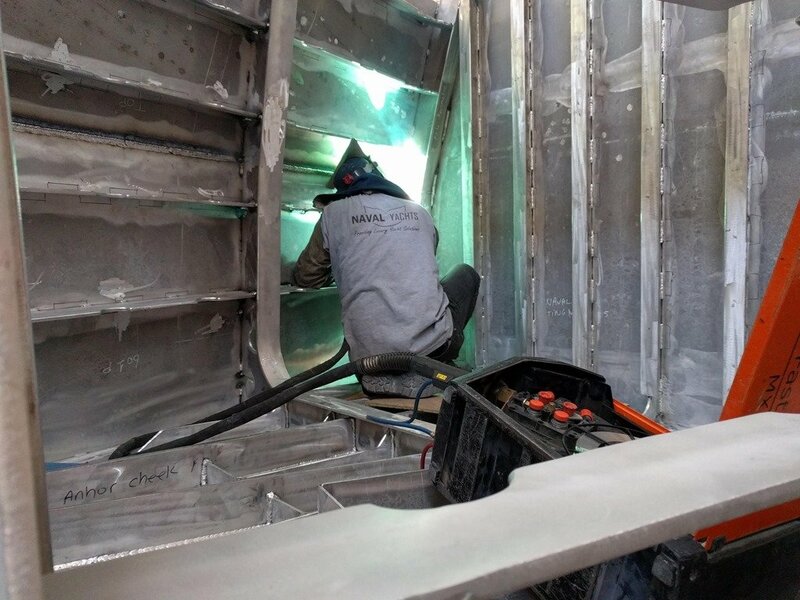 The Day Tank holds about 500L/132 USG and we anticipate our maximum fuel burn rate to be less than 20L/5.3USG per hour so this tank should have enough fuel for more than a 24 hour and 250nm day on passage. 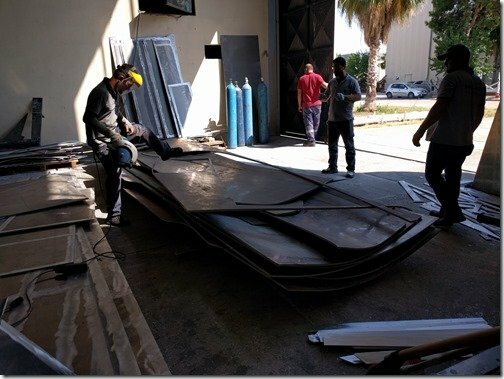 This was the very beginning of prepping the plate for the Day Tank and other new parts earlier this week. 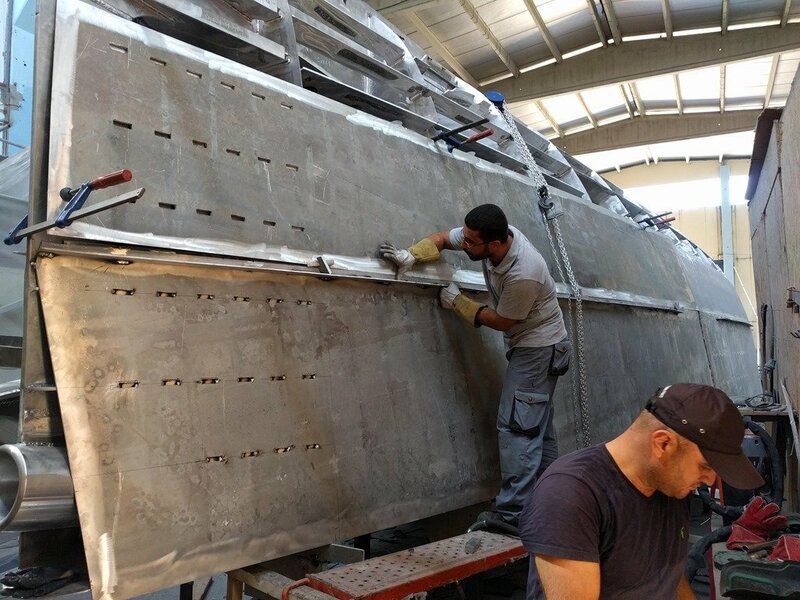 The most visible change on the hull this week was the addition of the final aft section of the eXtreme Keel Bar. This is the Before shot of the aft end of the hull…..
….. and this is the after shot with the Keel Bar set in place. 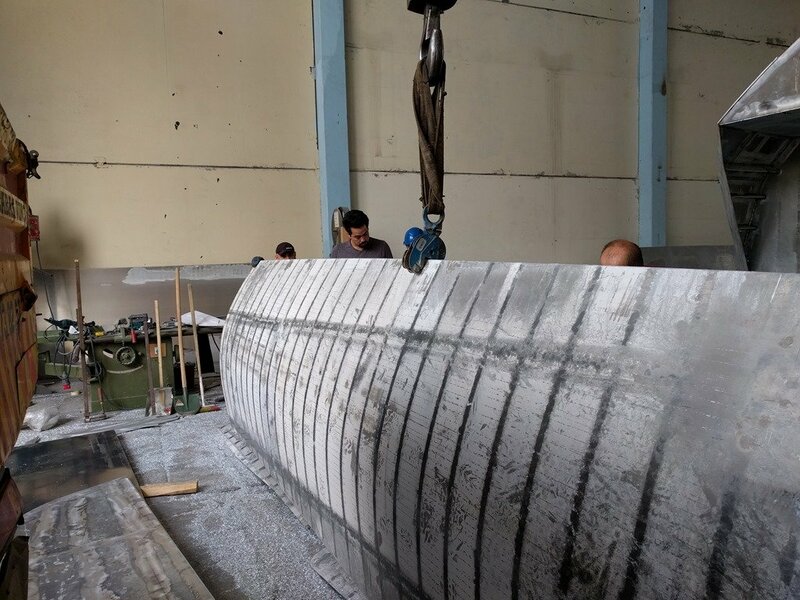 Enver and Umit are making sure this section of the Keel Bar is precisely positioned just right prior to tacking it in place. 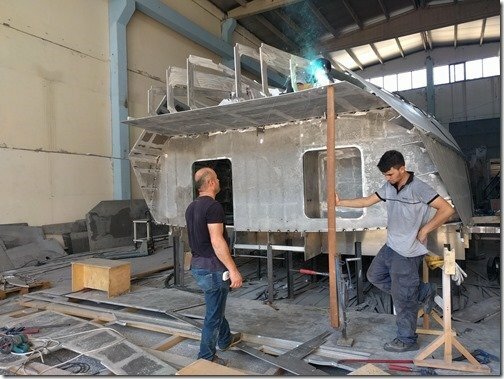 Sezgin, in blue, is of course welding non stop all day every day trying to keep up as the rest of the team add more and more parts for him to weld. 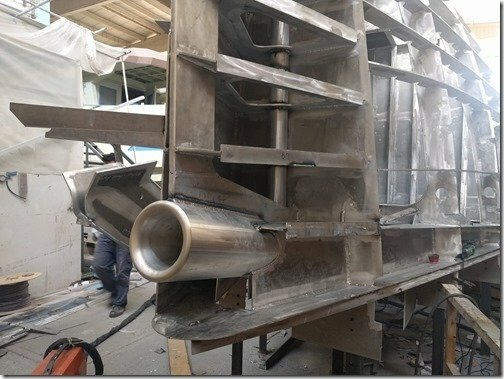 You’ve seen the forward sections of this 25mm thick Keel Bar being fitted in previous weeks including the truly eXtreme bow section where the Keel Bar curves through 90 degrees to go all the way up to deck level and form the Stem Bar and sealed collision crash bulkhead. 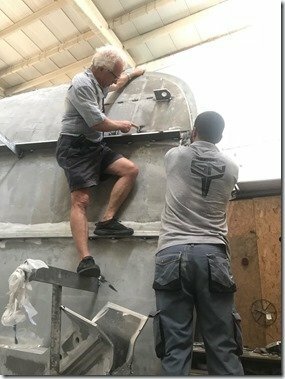 This aft section now completes the placing of the Keel Bar. 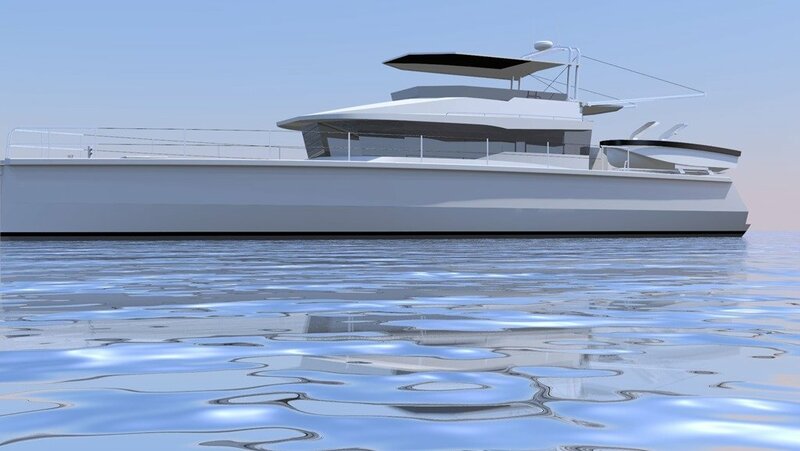 This quick clip of the model will help put this into perspective for you. 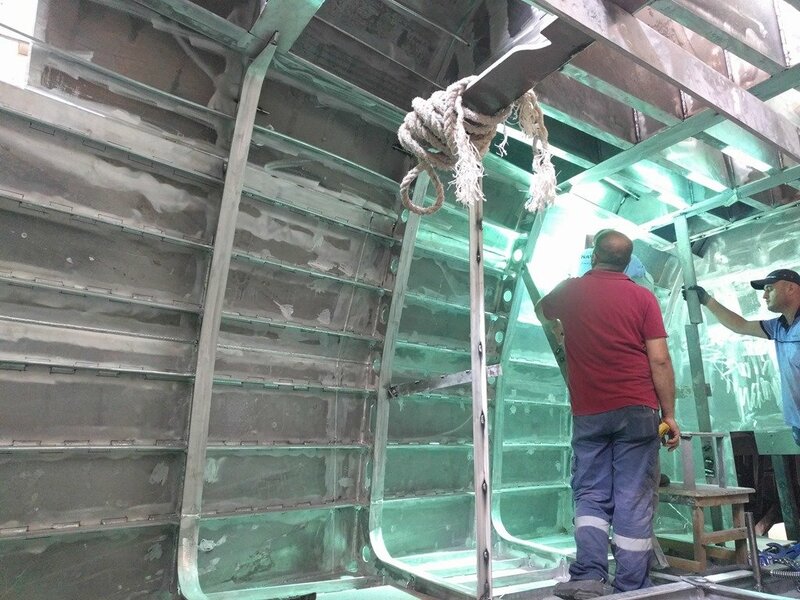 The dark green is the beefy Keel Bar you see in the photo above. 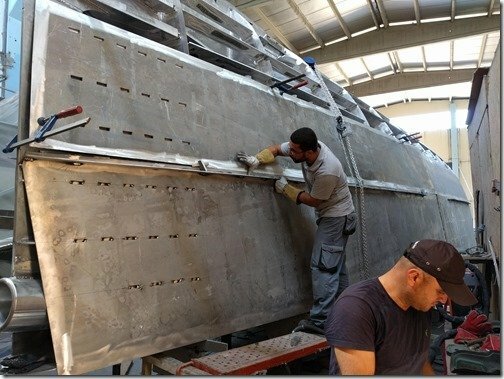 If you are wondering, that section in the middle of the Keel Bar and down by Enver’s knee above, with the thin vertical connectors are just temporary to keep everything aligned. That gap is where a large thick walled AL tube will be welded in place to house the propeller log tube and shaft for the Nogva CPP prop system. 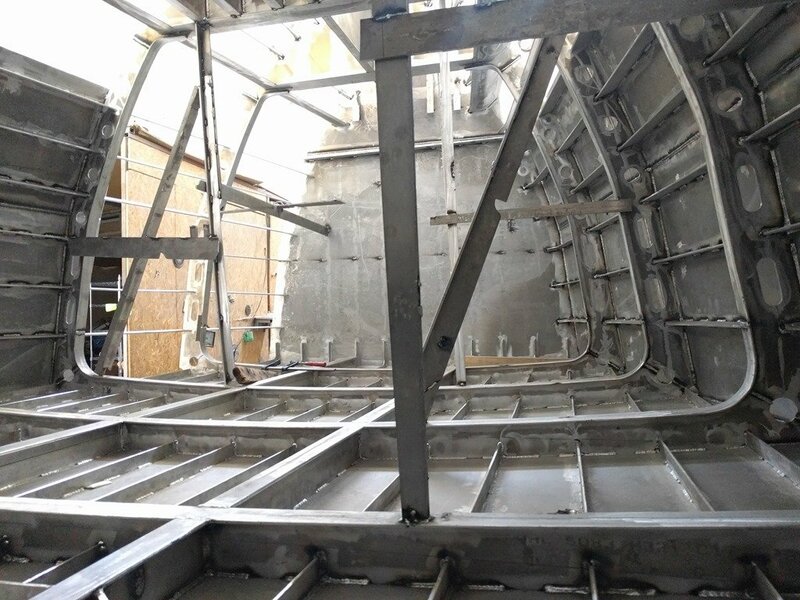 Standing inside the Workshop and pointing the camera forwards along the side of the Keel Bar you can see where the prop tube fits once those spacers are cut out. This perspective also clearly shows how the Keel Bar fits into the slots cut into the transverse frame #20 and where that prop shaft tube will pass through. 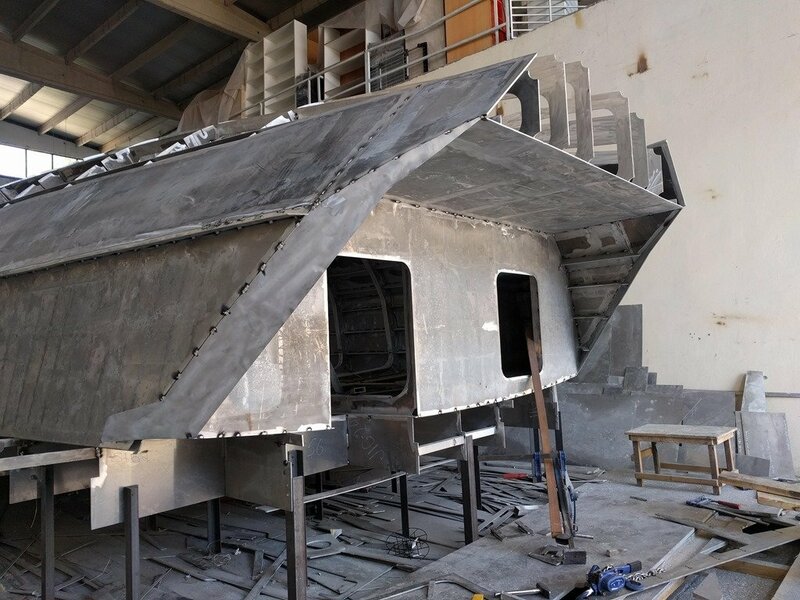 All this will be fully welded up once we have all the other parts of the hull framing and hull plates in place to create an extremely robust aft end. 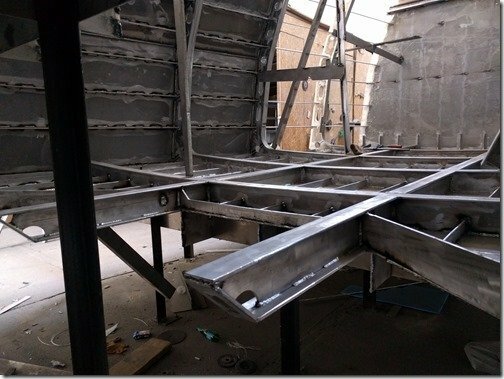 Moving the camera just forward of Frame #20 you can see how the rest of this aft section of the Keel Bar continues forward and is captured and precisely positioned by the slots in Frames #19 in the foreground, 18 and 17 which is also the WT Bulkhead between the Engine Room/Workshop area and the Guest Cabin aka Christine’s Office. 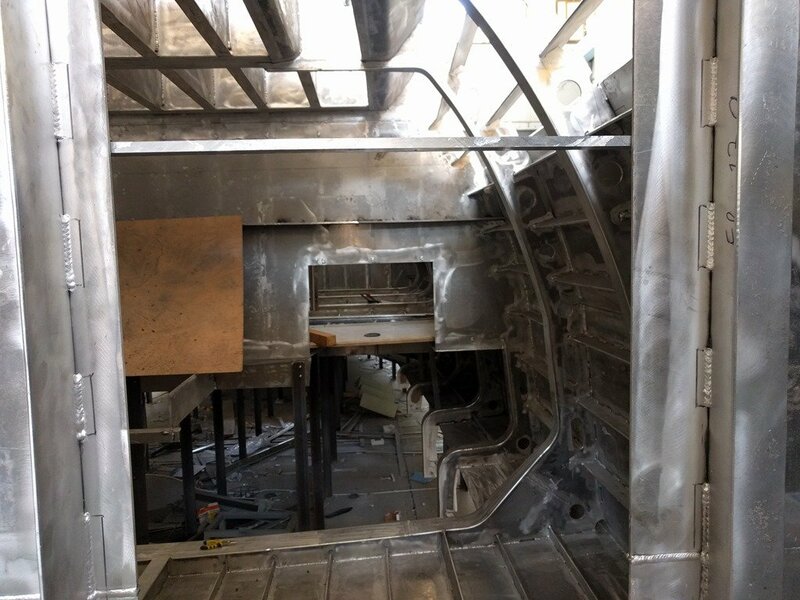 Turning around 180 and looking aft at Frame #20 again this shot might help complete your visualization of this area and how the framing all comes together. 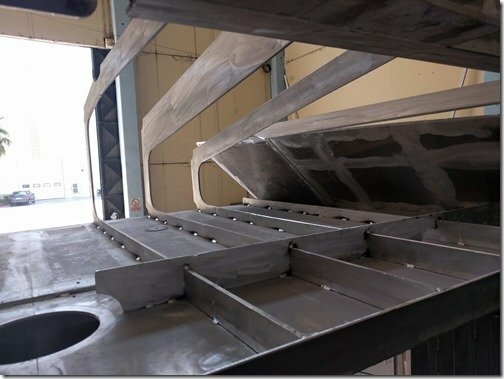 If you look closely (click to enlarge) on either side of the center Keel Bar those sloping lengths of 25mm AL form the beds for mounting the main engine and CPP servo gearbox. 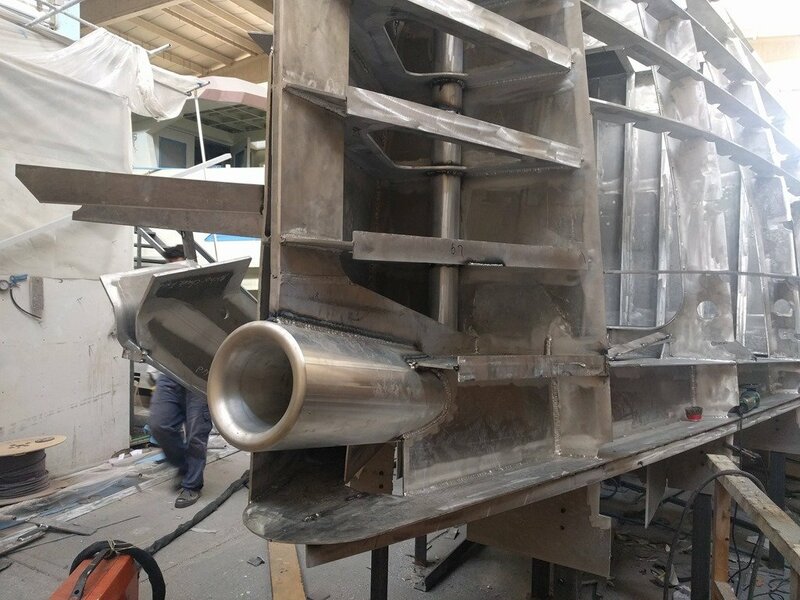 Thicker than needed in the eXtreme to fully support the engine and gearbox but we have supersized these engine beds because one of the ways to reduce vibration and noise is with mass, and these are eXtremely massive because we want an eXtremely quite boat. 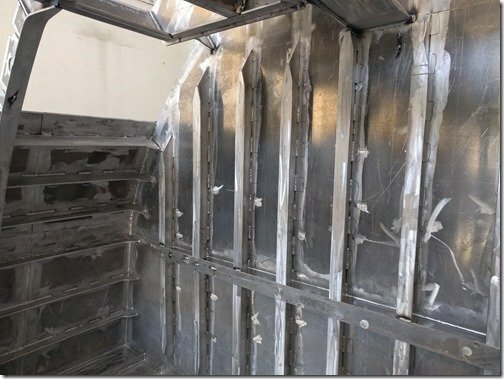 While I am inside let me show you around some of the different interior spaces on Möbius so you can see how those look from the inside right now. 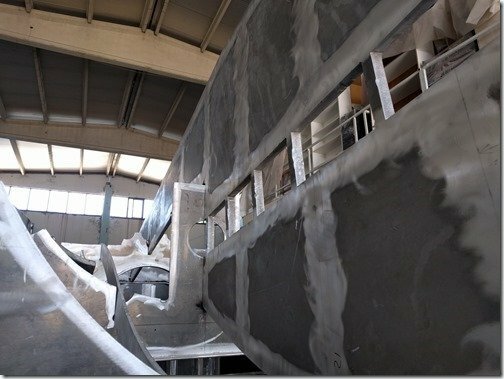 Be sure to check out the video at the end for an even better tour of the inside areas. 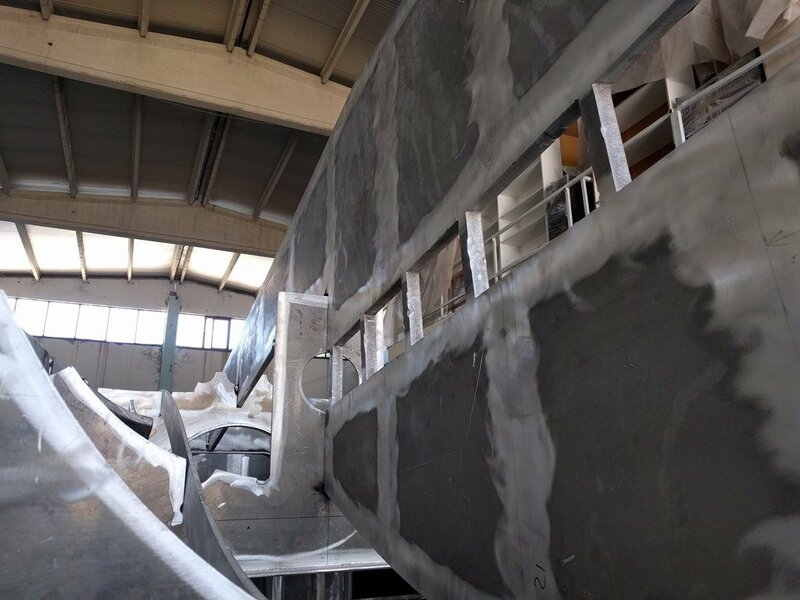 It is a bit of a challenge to visualise these interior spaces at this stage of construction so I’ve done this quick and dirty clip of the upside down hull all stripped away to show the main spaces. 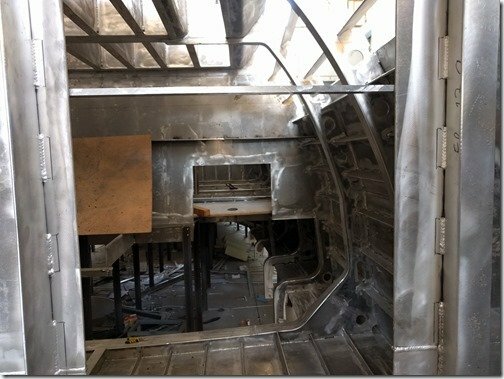 This is looking aft through the door into the Workshop/Engine Room we just left and now standing inside the Guest Cabin/Christine’s Office. 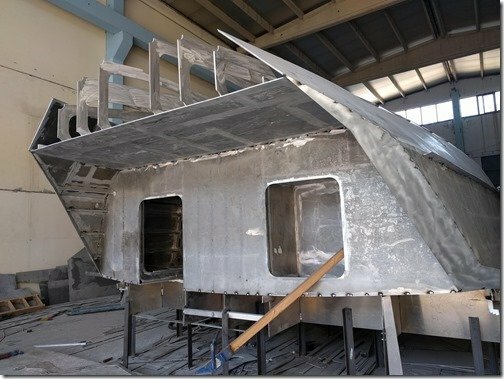 Moving aft and turning 180 to stand beside that doorway above and look forward, this shows the rest of the Guest Cabin/Office. 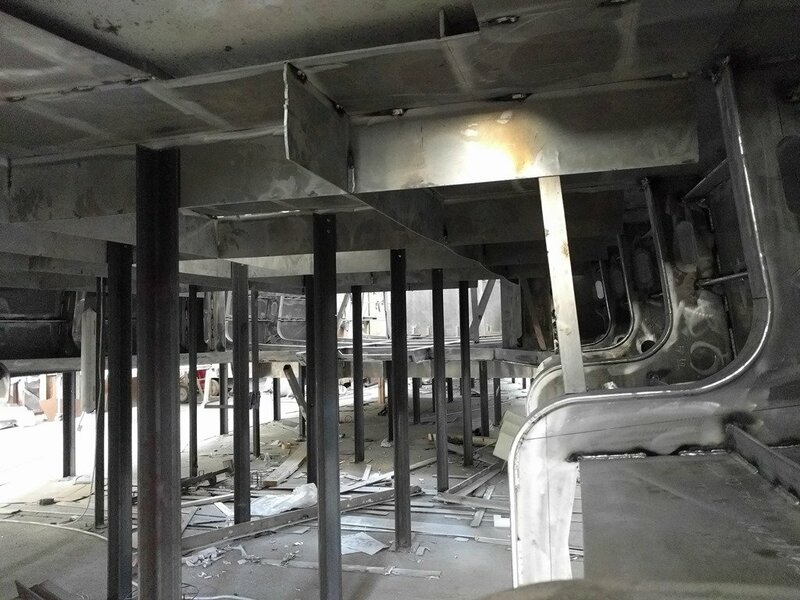 All upside down of course but you can start to get the idea of this nice big space. In both pictures looking up you can see the ever present integral fuel tanks and all their baffles and get a sense of how this grid construction of the tanks creates such an eXtremely rigid and strong hull bottom. 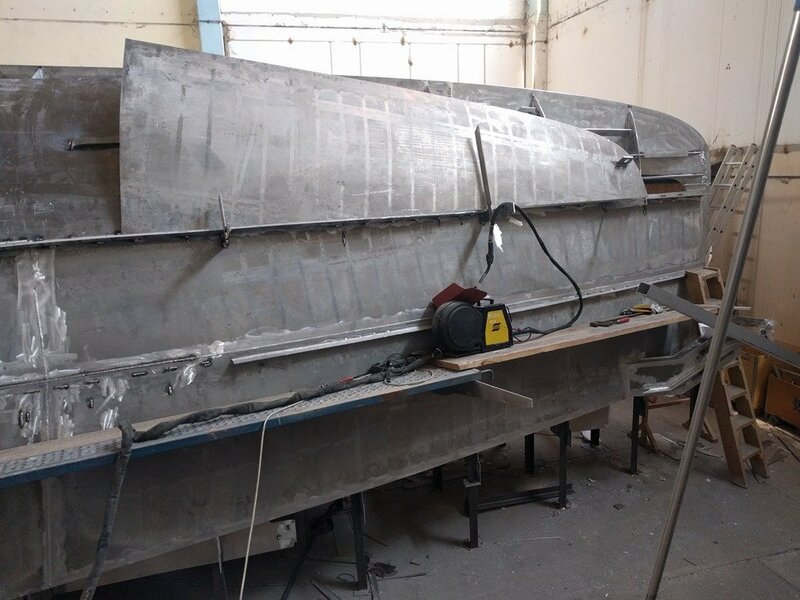 Just wait till we get the 12 and 15mm hull plates welded on there! 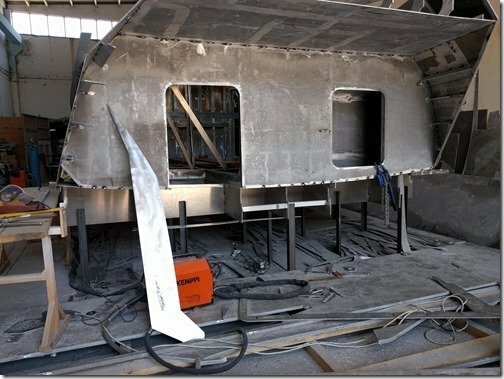 Stepping back into the Workshop and looking forward through the Workshop door will give you a better view of the length of the Guest Cabin and the doorway leading out of the Guest Cabin “up” into the main part of the Pilot House, the SuperSalon. The SuperSalon is our main living area with the Galley, Dining, Lounge and Main Helm station all wrapped in 360 degrees of glass. 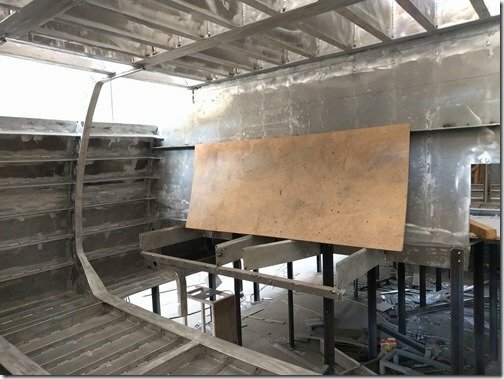 The above deck superstructure which is below this area will be added after we flip the boat right side up next month so right now it is a bit difficult to visualise this great room but if you look back at the labeled clip of the 3D model above I think you will get the basis layout. 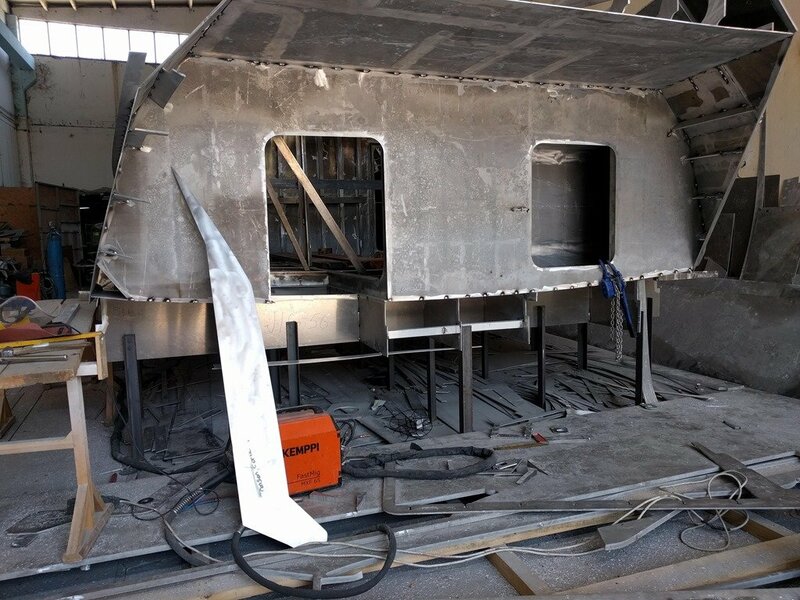 Here we are standing near the aft end of the SuperSalon in what will be the Galley and looking towards the forward end of the SuperSalon and this will give you a bit of as sense of the size of this room. 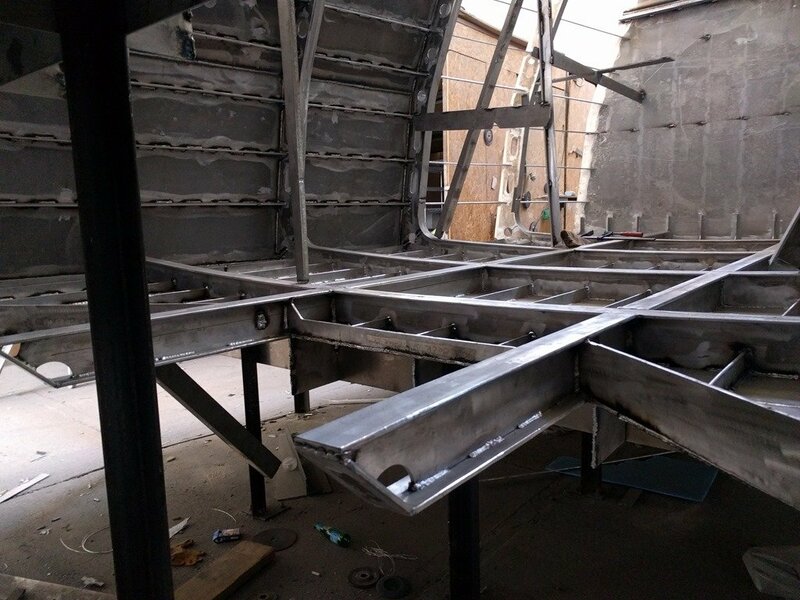 The floor is overhead and the massive frame #13 in the foreground on the right forms the support for the superstructure which will go on after we flip the boat next month. 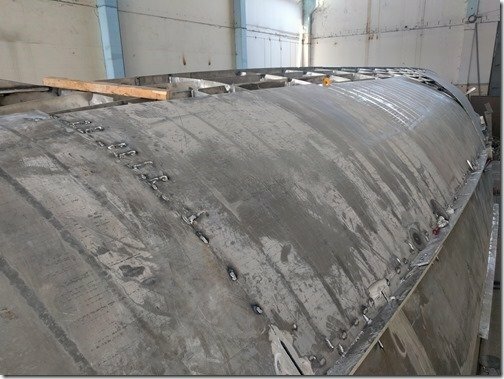 These two beams in the bottom foreground provide the support for the forward end of the Pilot House/SuperSalon where the main Helm Station will sit. What you see looking all the way forward in this photo and the one above is Frame & WT Bulkhead #4 at the front end of our Master Cabin. 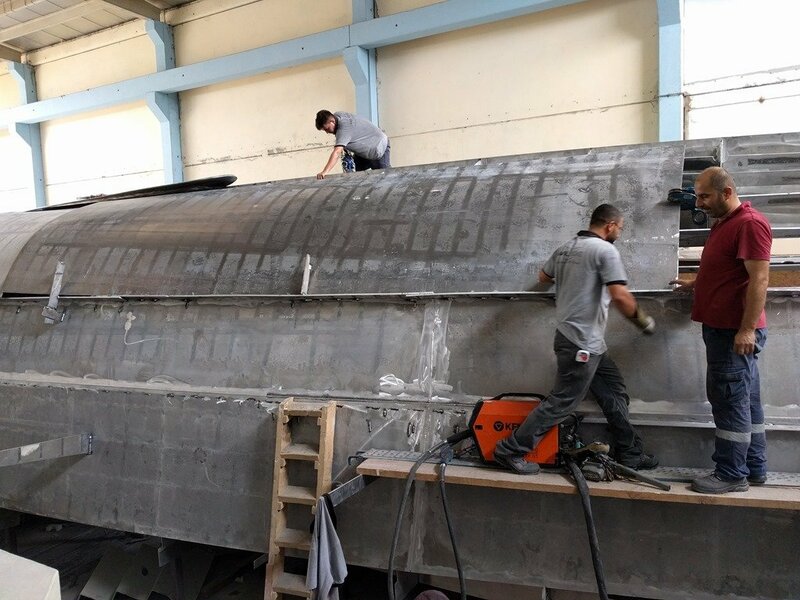 Popping back outside you can see that Sezgin and the other welders have been busy welding up the first two rows of hull plates. 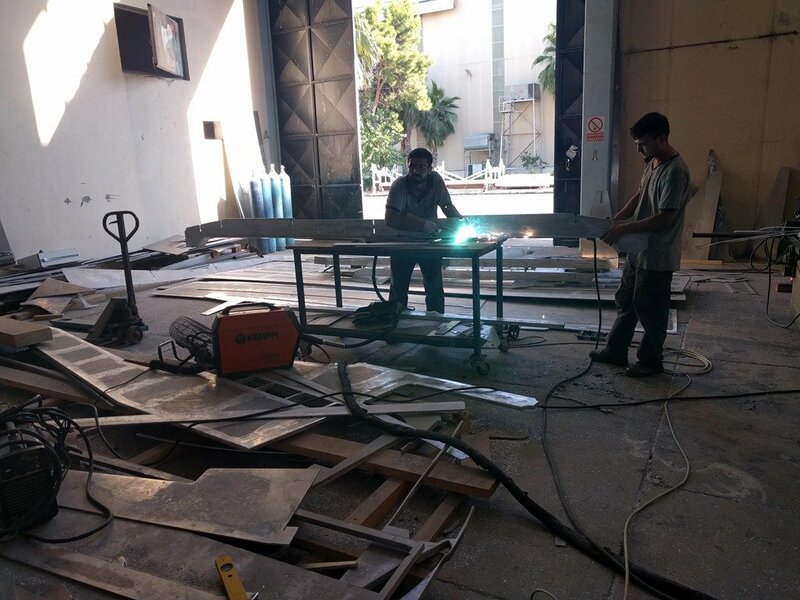 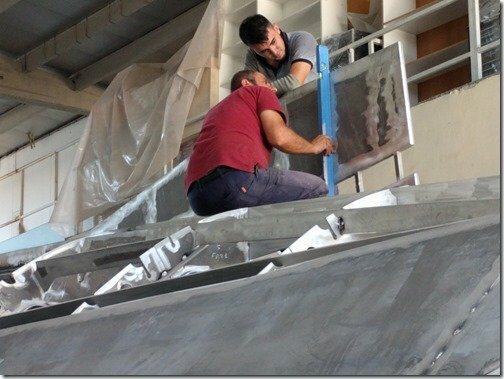 Uğur and Umit are carefully wedging this intersection of hull plates so they are all flush before Sezgin comes and welds them up. 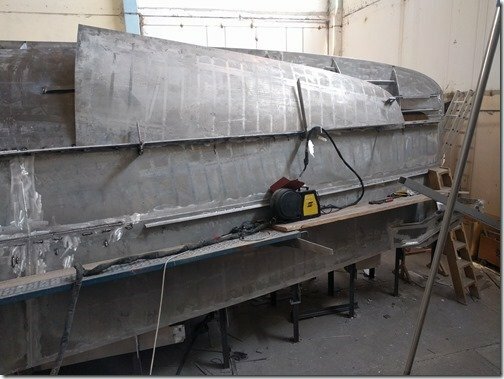 Welding all done, fairing bars removed. This is standing about mid ships on the Port side looking forward and you can just see the anchor roller assembly at the very far end. 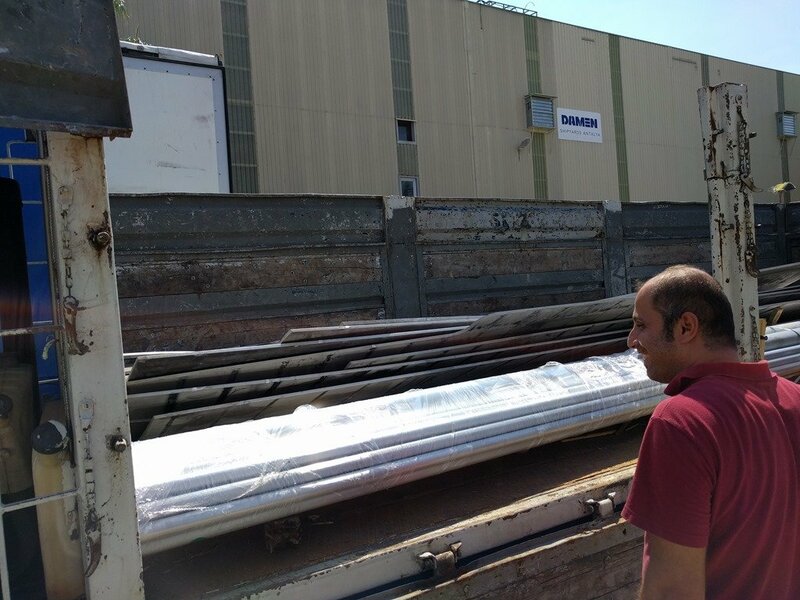 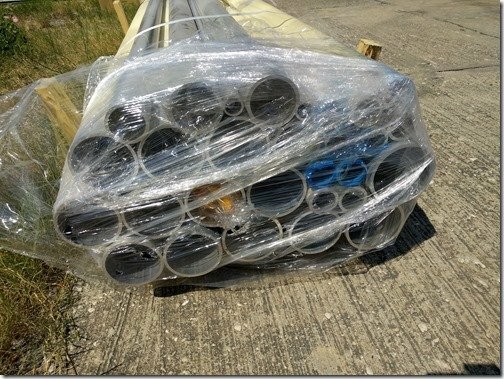 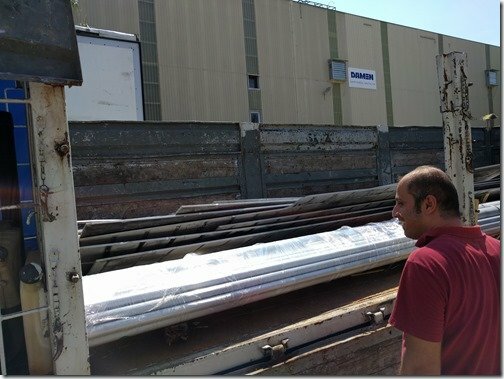 Saving the best for last, yesterday the latest truck load of aluminium parts arrived with all the pipes and 3D curved hull plates. 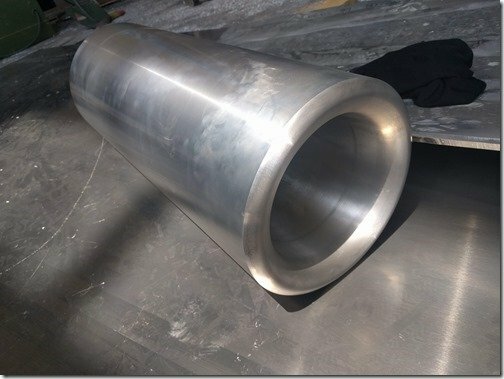 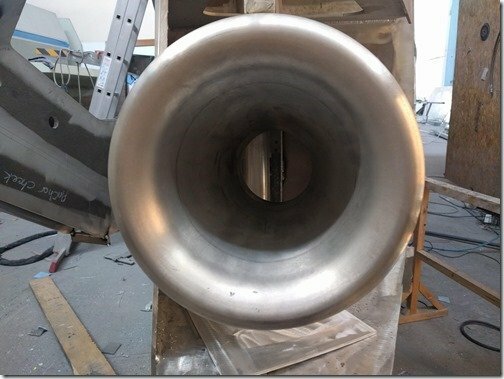 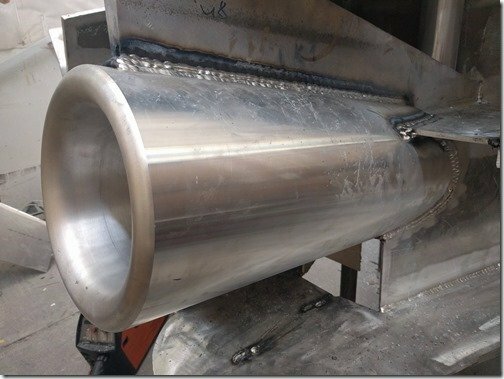 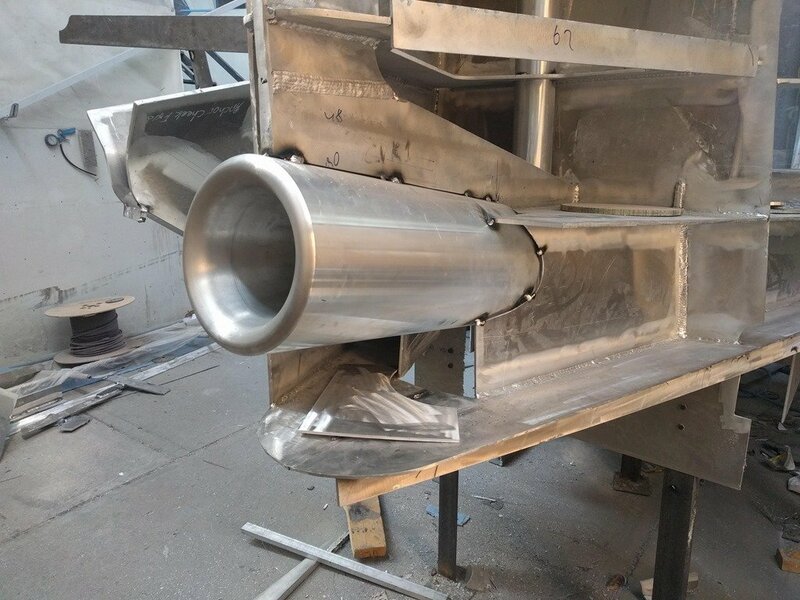 These various size pipes will soon be fabricated to form things like the big foldable arch, the paravane A-frame booms, stanchions, rudder tubes and prop shaft tubes. 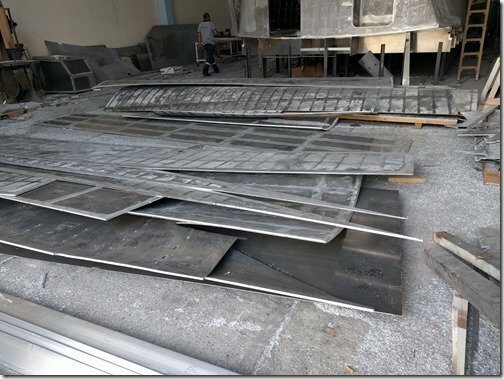 The curved hull plates are the most exciting, at least for me and these next few shots are from the bending shop in Istanbul a few weeks ago. This is still one of those processes which has yet to be automated and remains a very rare and highly skilled all manual task so these guys are in very high demand, but Burak & Dincer were able to convince them to send us these 4 shots as they were bending our plates. 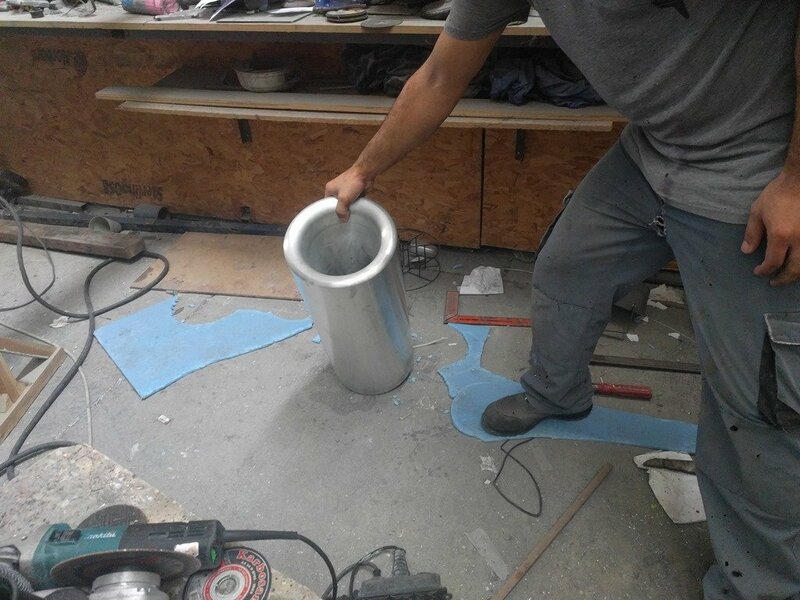 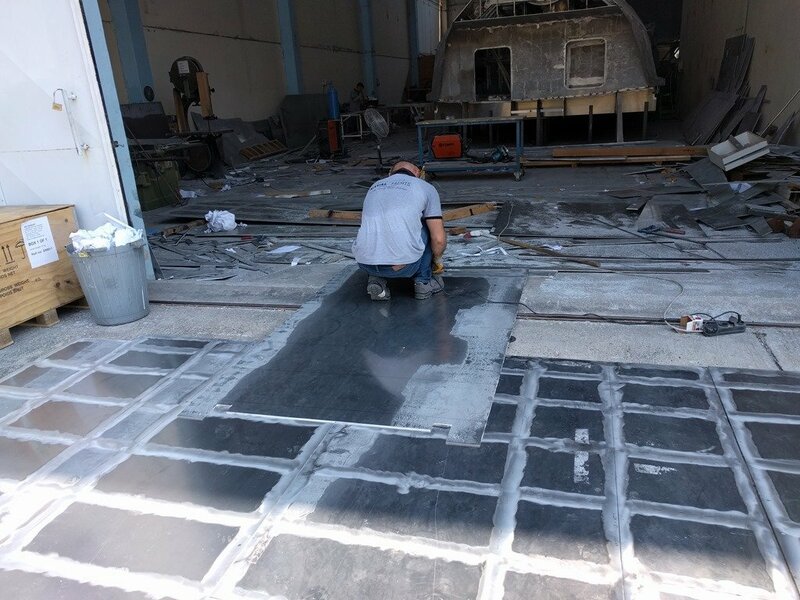 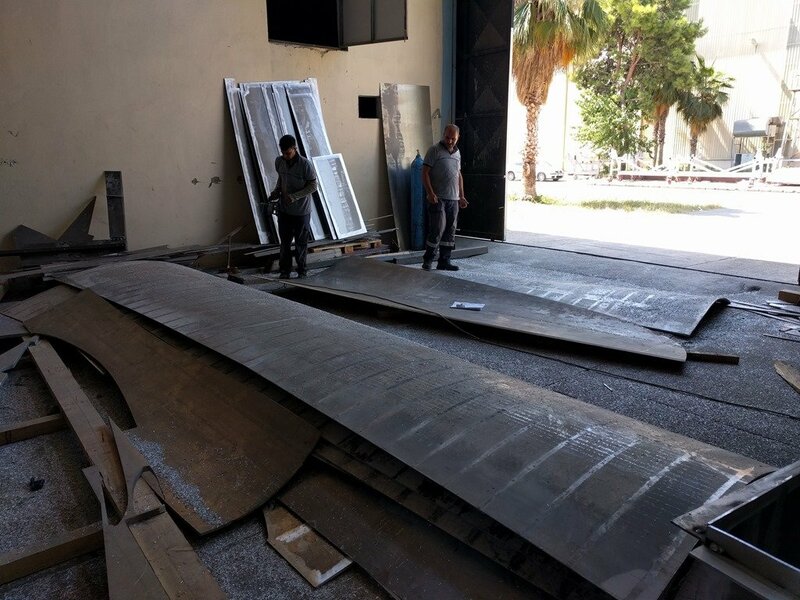 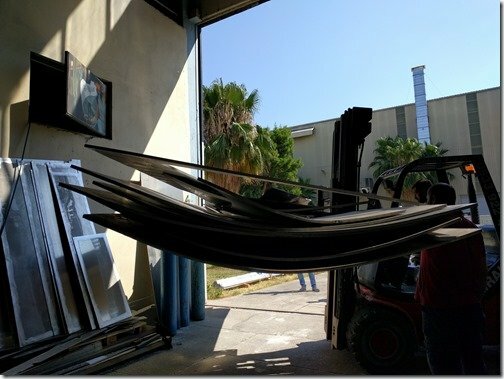 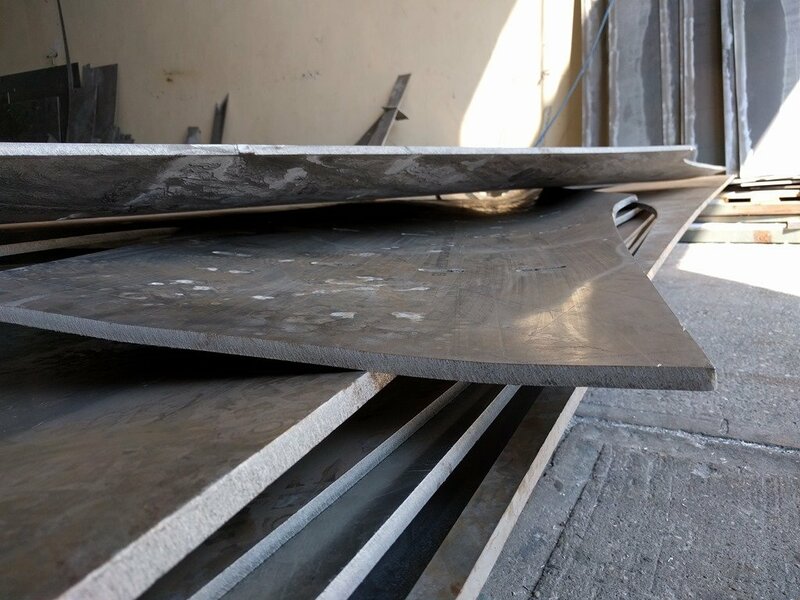 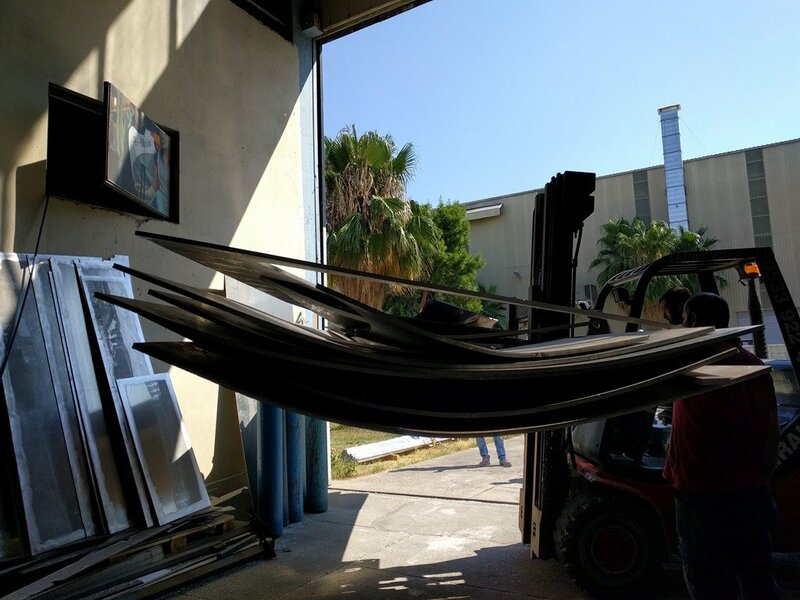 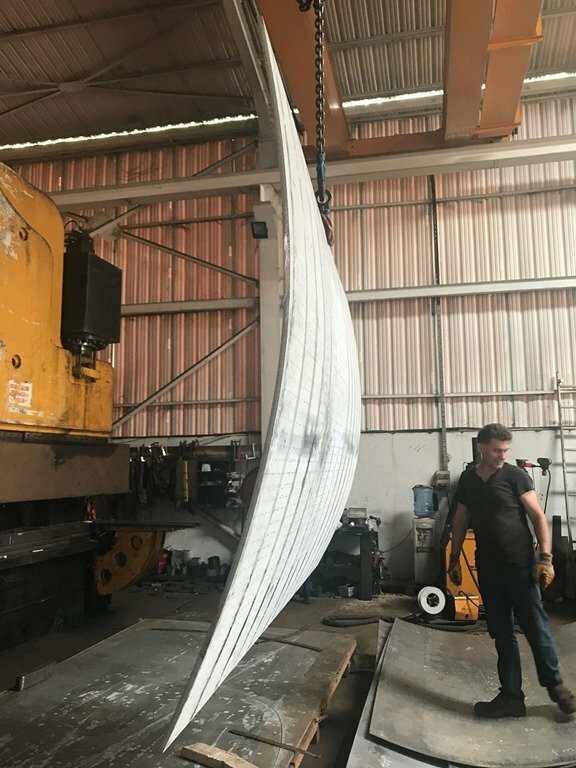 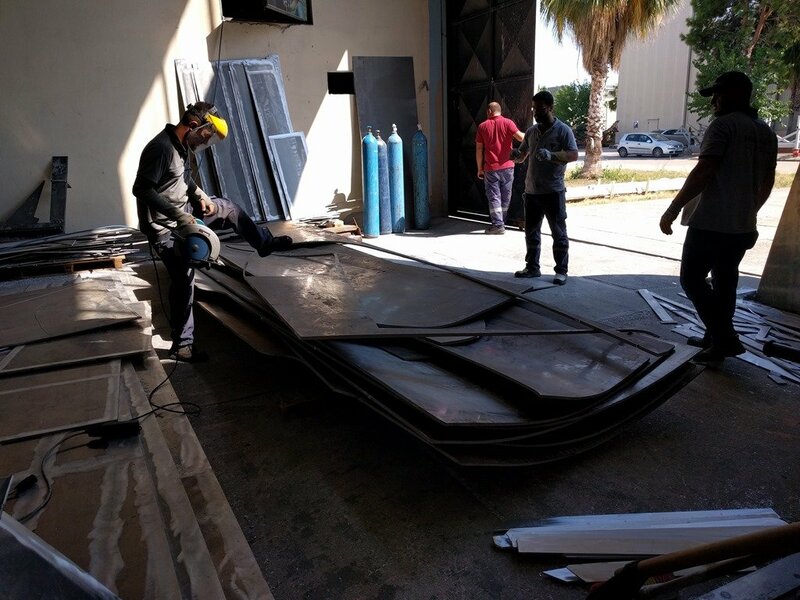 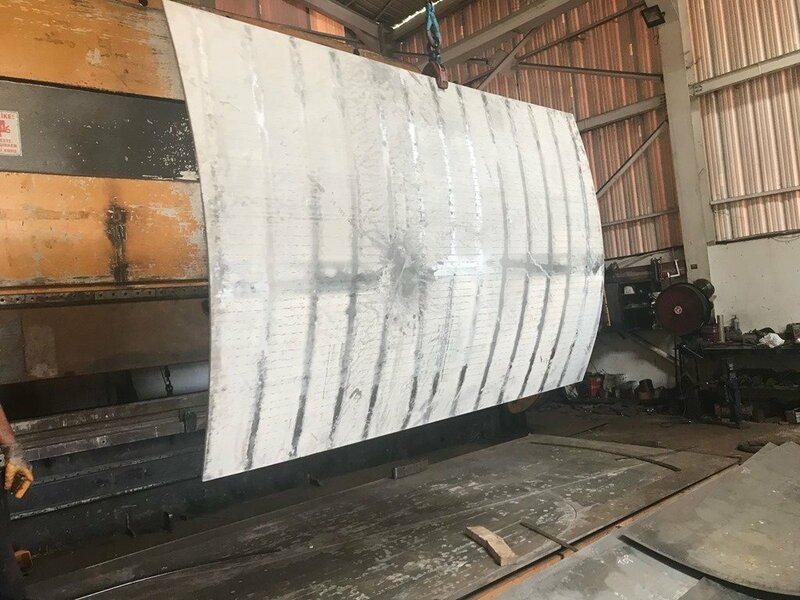 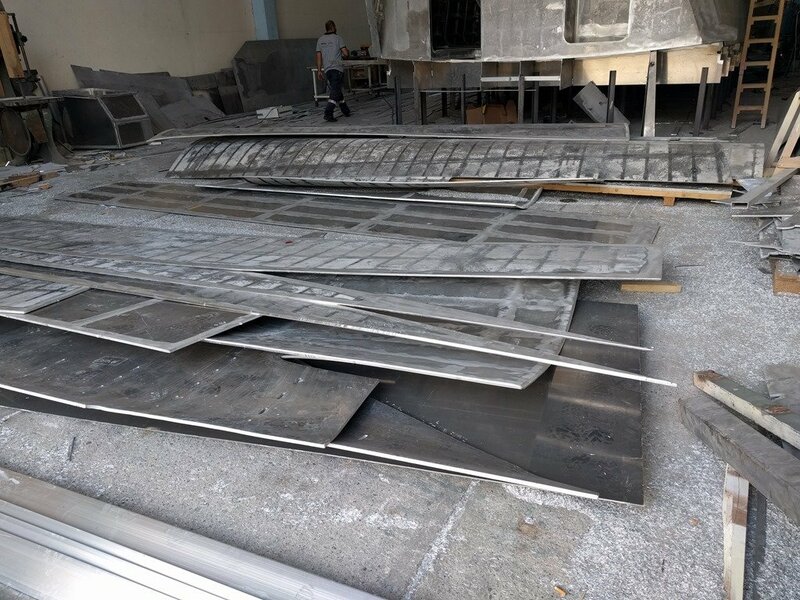 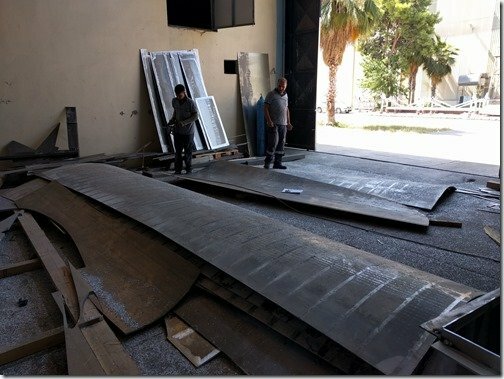 The shop in Istanbul which does this amazing 3D curving of the plates had a very big job that was scheduled prior to ours so we have had to patiently wait for them to bend all our bottom hull plates and truck them to us. 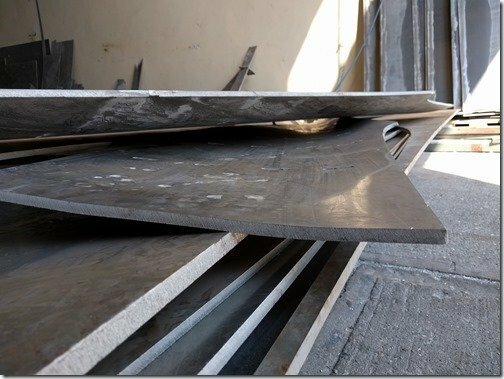 Difficult to capture but this shot will help you see the complexity of these 3D curves as they were bending this plate. 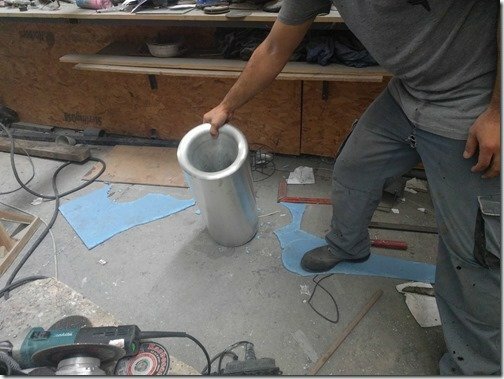 ….. and into the shop floor behind Möbius. 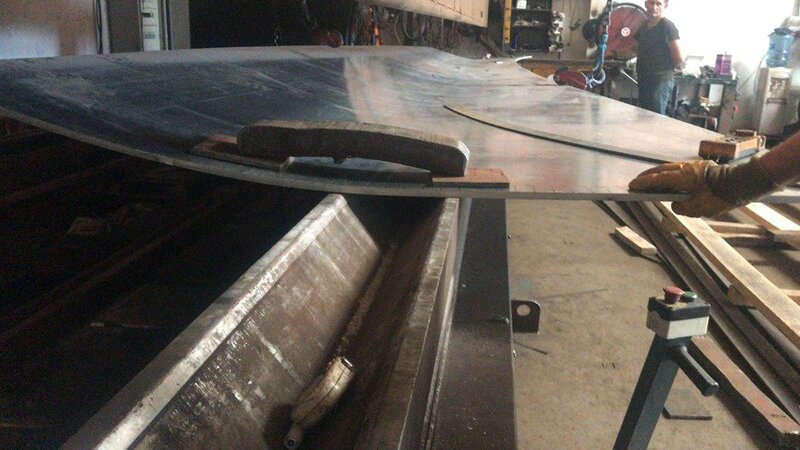 Even though it was late Friday afternoon, the boys wasted no time unstacking these very heavy thick plates to get at the first one and starting prepping the edges so they can hoist it up on top of the hull framework and tack it in place next week. 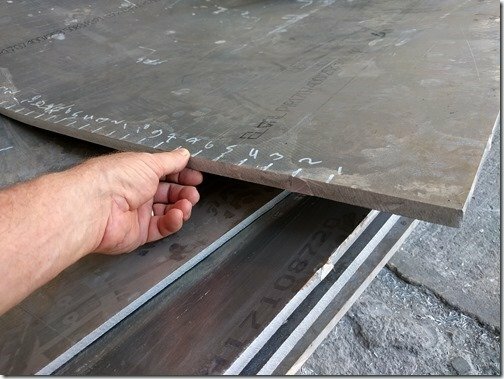 My hand and thumb will give you a sense of the size of these 12 and 15mm plates. 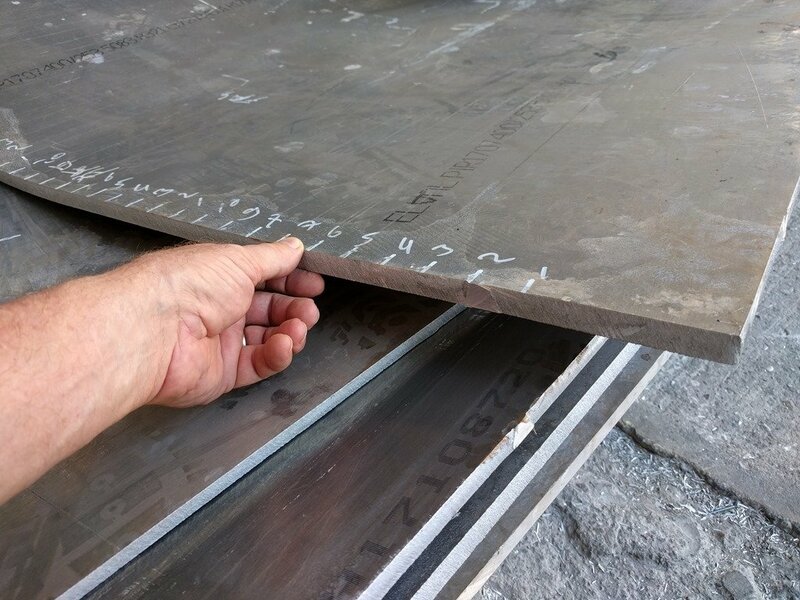 The numbers you see are part of a grid which is used to align a series of templates the bend shop makes up from the 2D drawings Burak sent them which they lay on the plate at these points to check that the curves are just right. 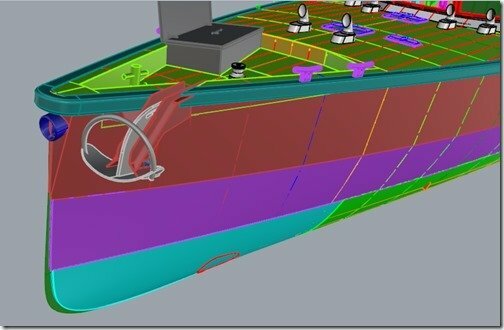 As you can see these are very complex 3D or undevelopable curves to match the sleek curves of the bottom surfaces of the hull. 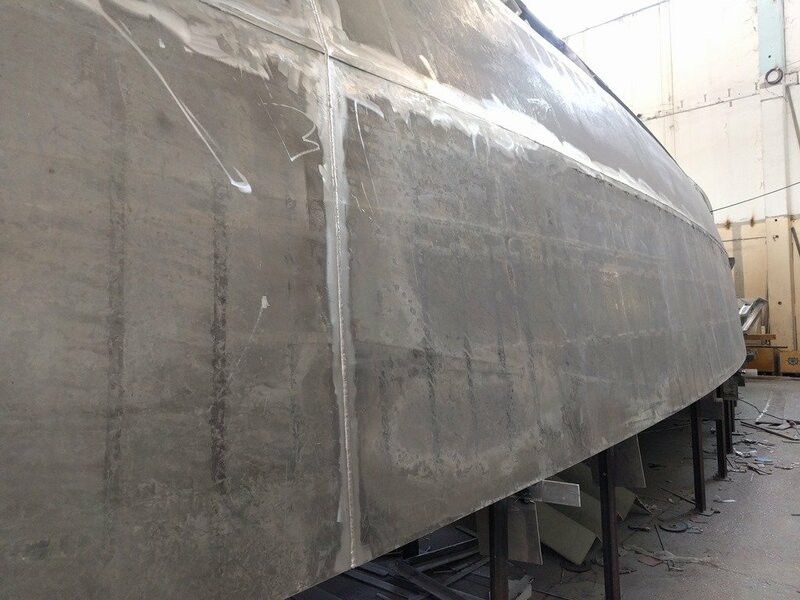 As these get tacked in place in the next 2 weeks all those slippery curves of the hull will very visibly emerge and you won’t need any imagination to see this sleek slippery hull. 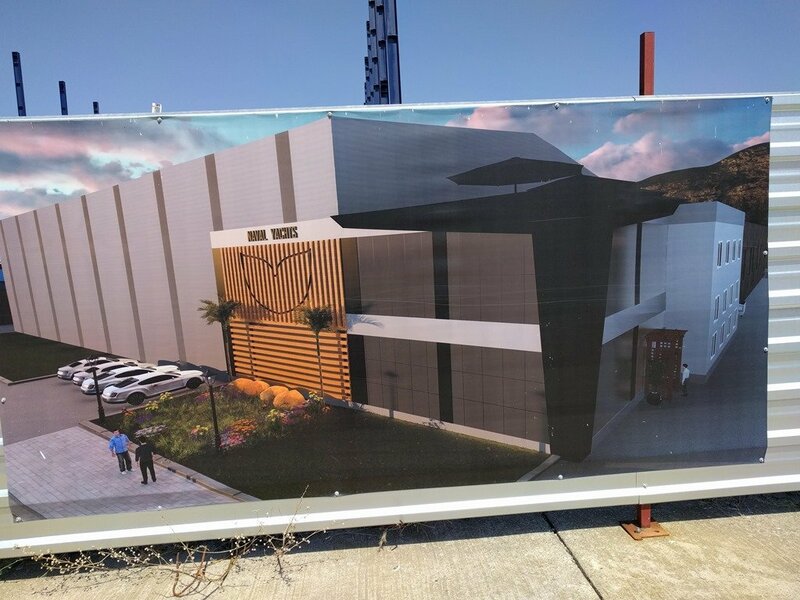 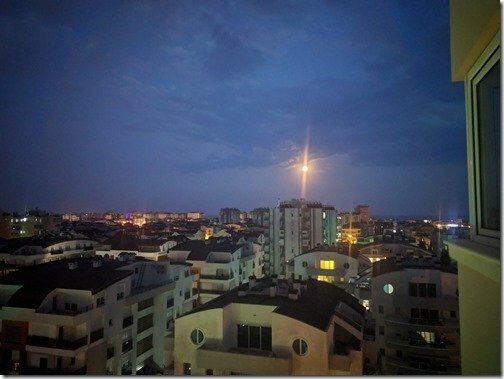 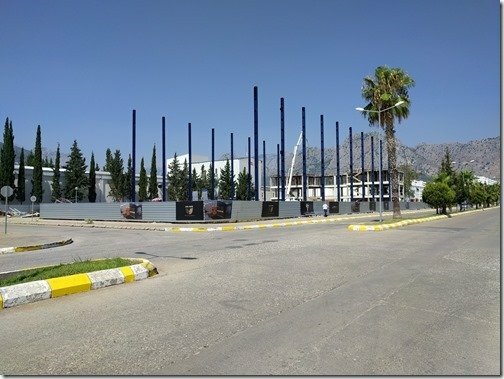 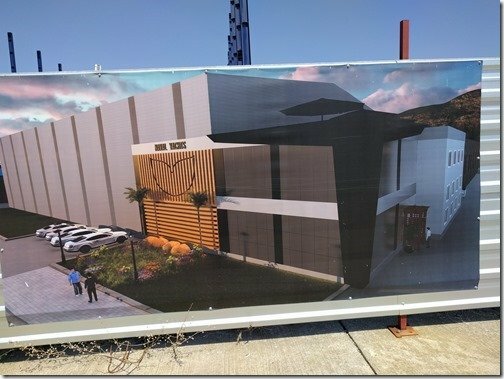 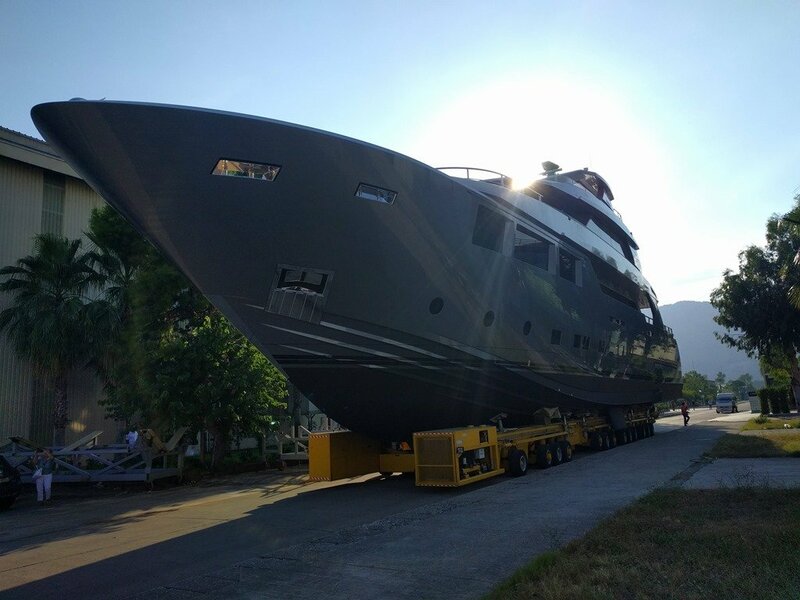 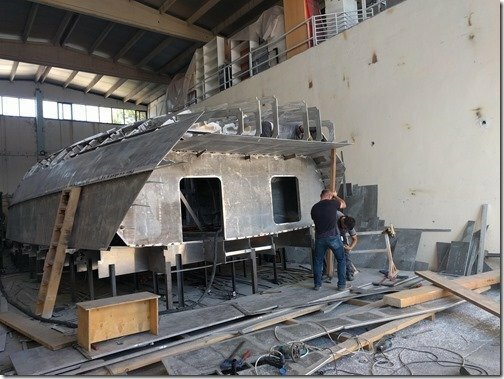 So that’s the week that was July 9-13, 2018 here at Naval Yachts and the building of Möbius. 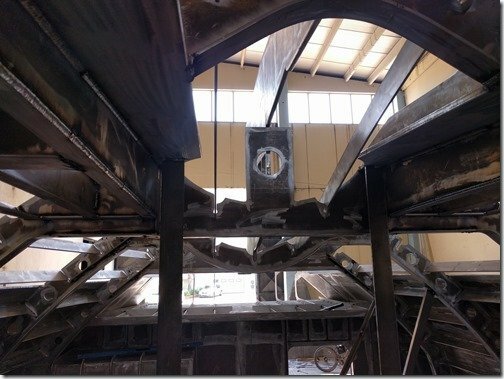 The summary video compilation is below and will help put all of the above together for you. Thanks for taking the time to follow along and remember to add your questions and ideas in the Comments section below. The heat was way up all this week both inside the building and outside. 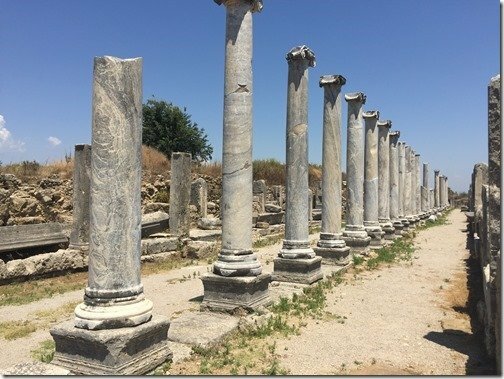 Like most parts of the world apparently we had quite a heat wave this past week with daytime highs often getting over 40 degrees. 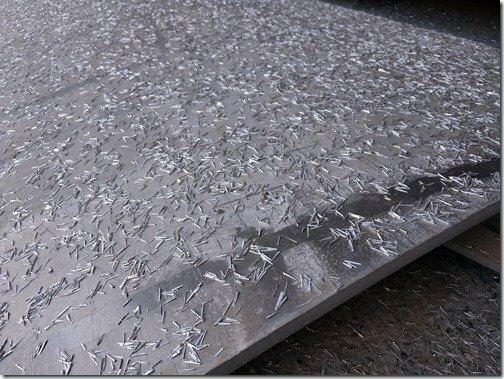 That’s over 100 for you Fahrenheit types. 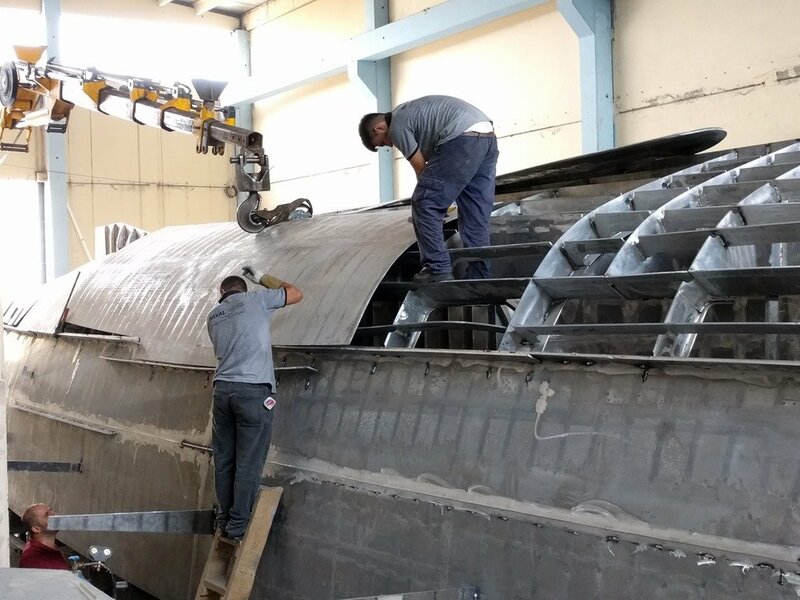 Not the best week to chose to really up the amount of MIG welding going on inside but that’s the way it worked out and the boys at Naval never missed a beat. This was also one of those weeks where the progress is not so visibly obvious as much of the work was going on inside the hull and out of site as Sezgin and the other welders were busy laying down all the welds where the hull panels are in place and the stringers and frames can be welded to them. 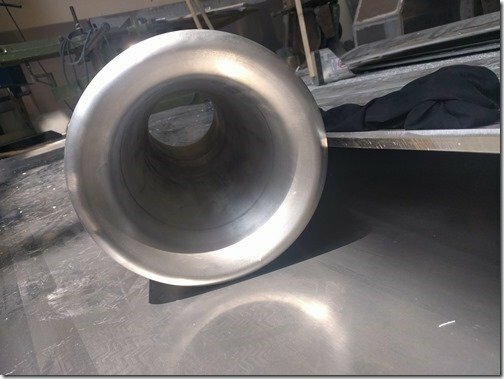 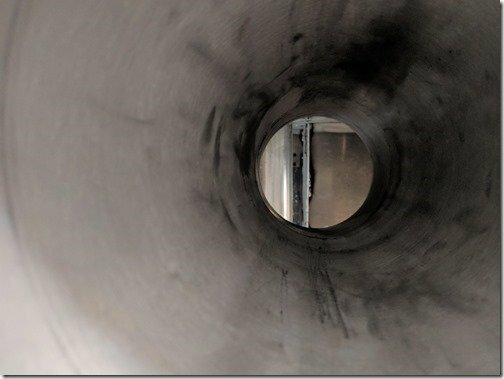 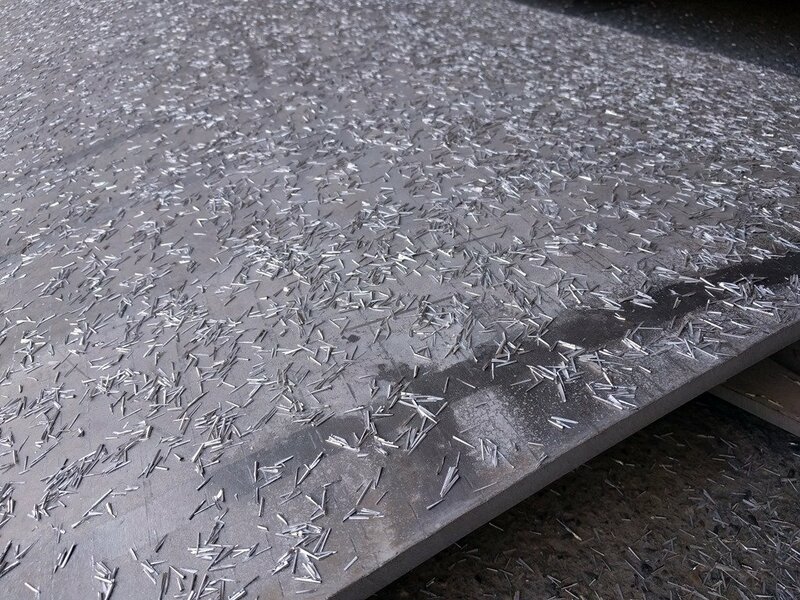 As you’ve seen in previous posts and you’ll see if you look closely at some of the pictures below showing these inside areas, the welds are not continuous but done in about 100mm/4” lengths alternating on each side. This is done to minimize the distortion caused by the heat of welding and has been working out very well. 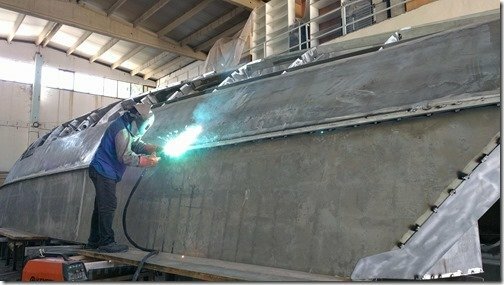 And this week also brought the milestone of the first continuous welds on the exterior of the hull panels. 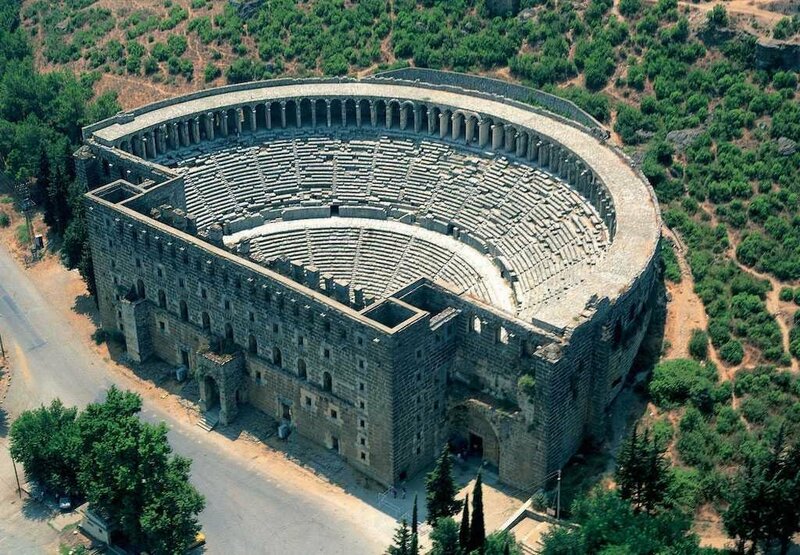 And Christine had a fun side trip with some friends to the awemazing ancient theatre of Aspendos so check that out at the end. 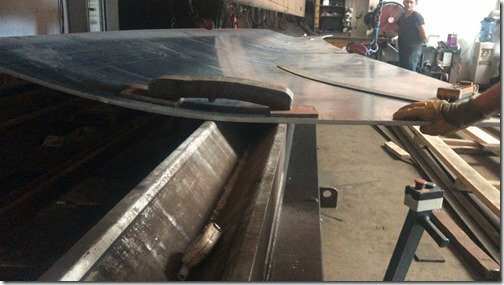 But enough words on on with the show! 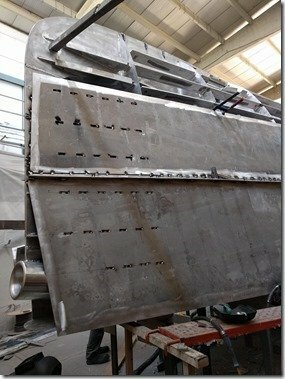 As per the title the most visible progress this week was on getting the aft swim platform plated. 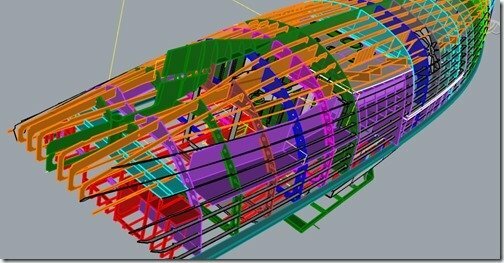 To help with your visualisation of this area here is quick & dirty rendering of the swim platform. 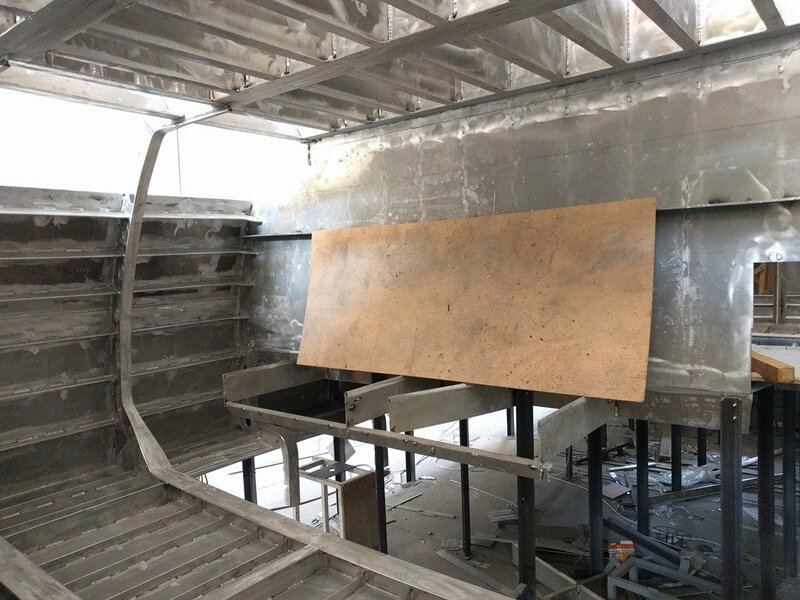 Stairs will provide additional storage underneath or “inside” from them, the opening to Port/left of the stairs is the fully sealed HazMat locker which will have a WT door on it for storing diesel, oil, paint, thinners, propane, etc. all outside of the boat. WT door Stbd/Right of the stairs is the entrance into the Workshop and Engine Room and the two boxes on either side are for storage and seating. Platform is 1.2m/4’ long and 2.6m/8.5’ wide so should make getting on and off the Tender and in and out of the water very safe and easy. 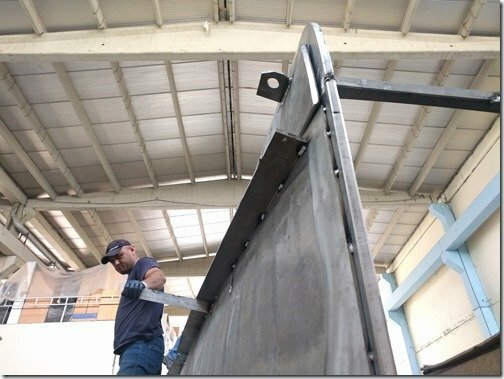 There will be the option of putting stanchions and lifelines along the aft edge to make it more secure if someone might want to be down there while underway hauling in a big Mahi Mahi. 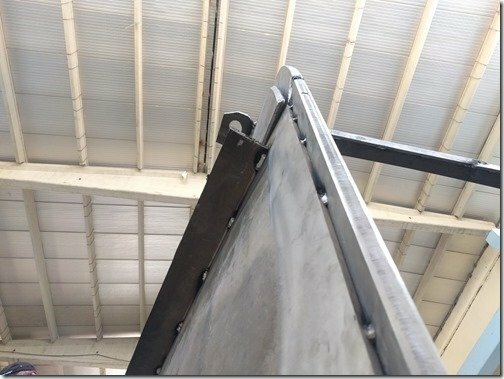 Back to the real and upside down world you can see the 6mm plate for the platform being lifted into place. 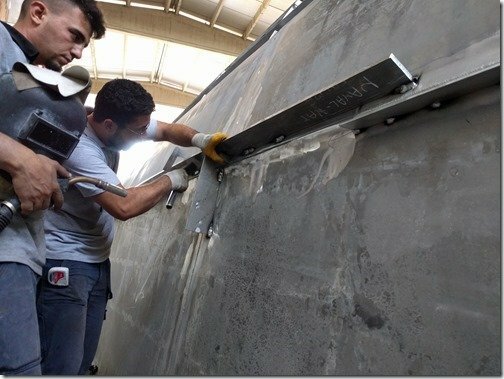 This manual jack with a board clamped to it is used to push the swim platform plate up tight against the stringers and Uğur tacks it in place. 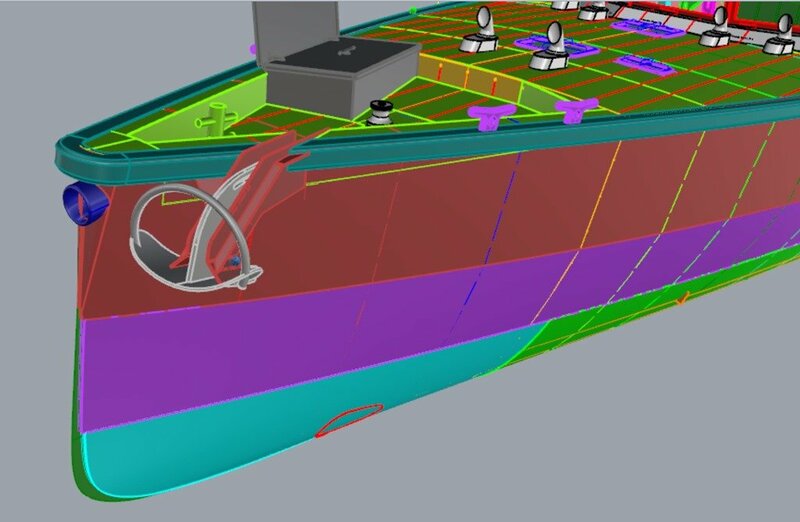 If you go back and look at the rendering above you can see how the hull sides make an angled transition around the aft corner and down to the Swim Platform. 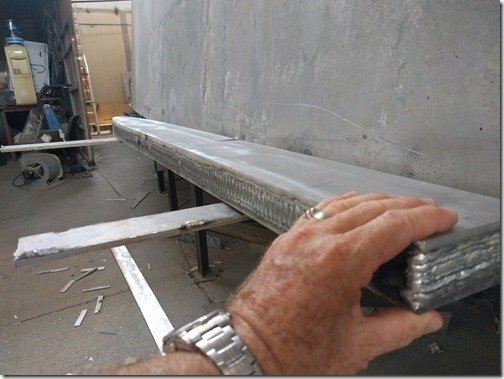 The piece you see here is about to be tacked in place along the aft edge of the hull plates. 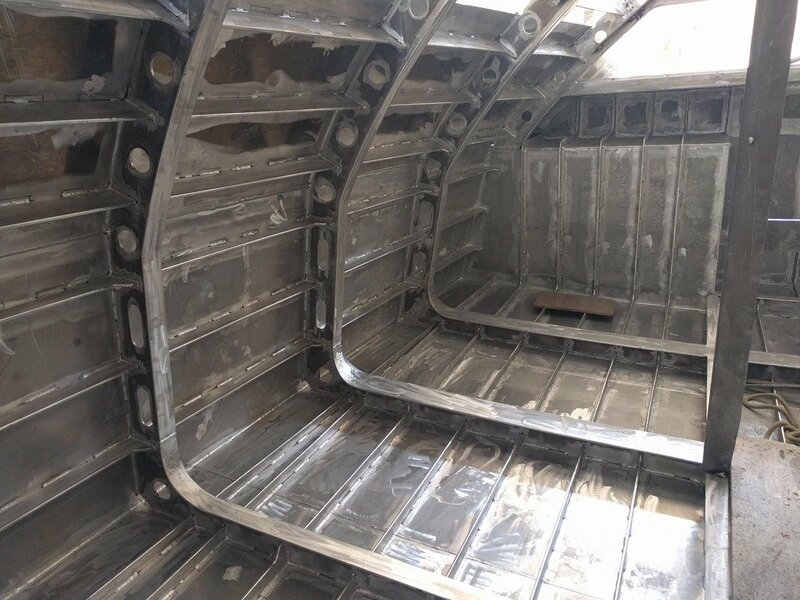 As per the rendering there are many more pieces which make this transition and form the seat boxes so you’ll be seeing that take shape in the next posting. 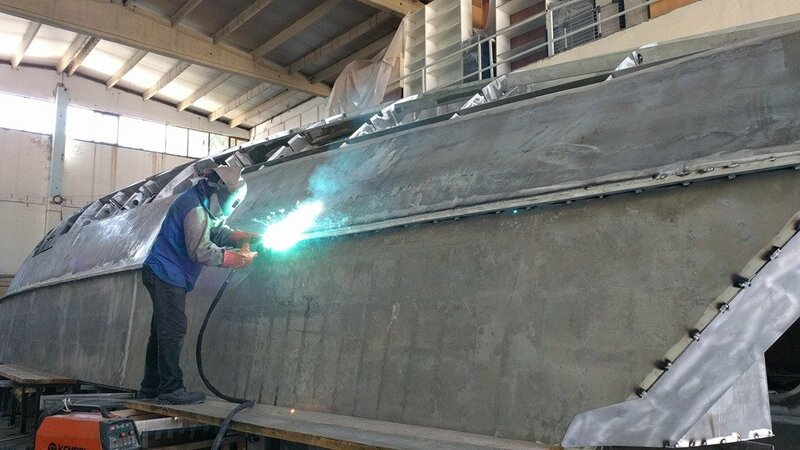 Meanwhile, inside Sezgin is hard at work as ever laying down miles of weld. If you click to enlarge this photo you can see on those vertical stiffeners how the welds are not continuous but done in about 100mm/4” lengths which alternate on each side to minimize the movement in the AL plate from the heat of the welding. If you stop and think about how many lengths of stringers, frames, stiffeners and bars there are in Möbius you will get a feel for how there are literally nautical miles of weld going in. 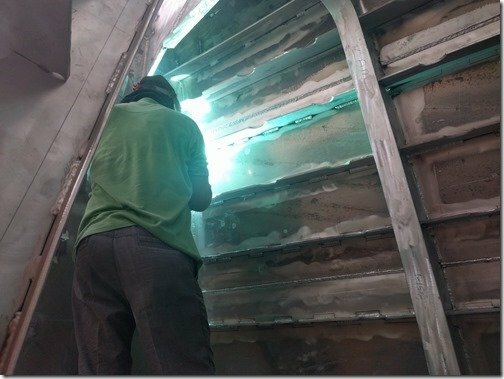 Each of which has to be cleaned before and after the welding is complete. Team Mobius here at GreeNaval are doing awemazing work! 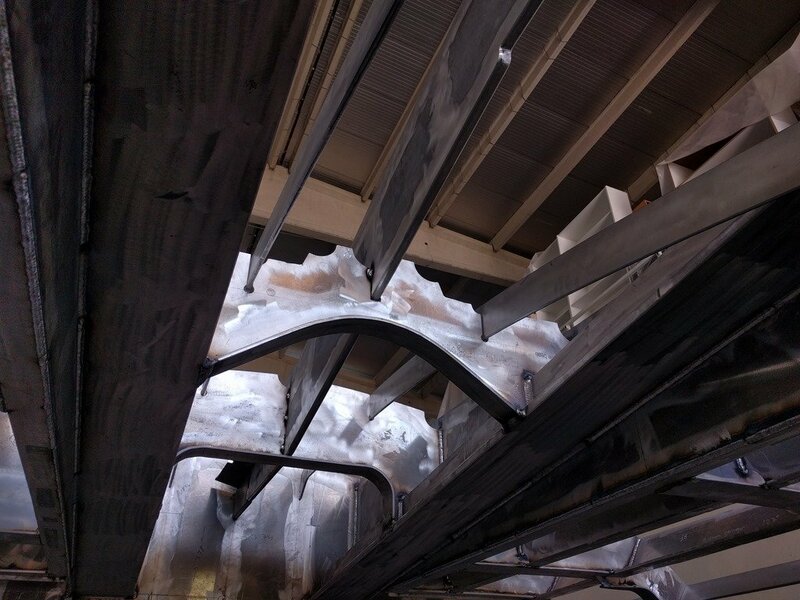 Here is a peek into what will be some additional long term storage area underneath the Swim Platform. 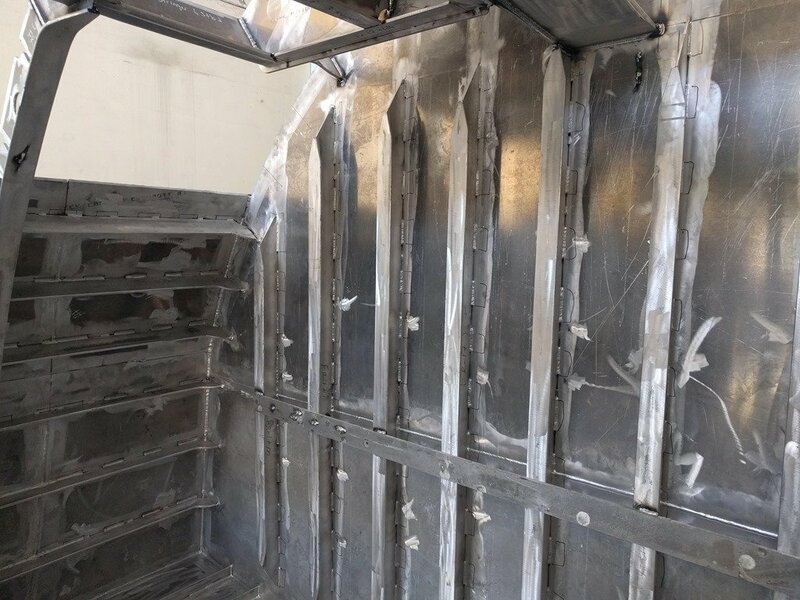 Lots of space that can be easily access from the Workshop and is completely sealed with no penetrations on the Swim Platform to preclude any water getting in. Probably a good spot for the four spare CPP prop blades for example. 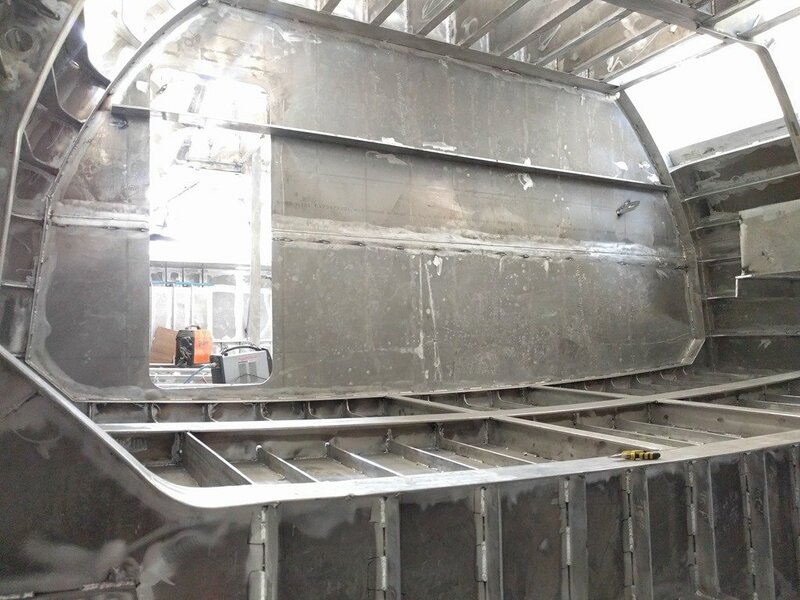 That large hole in in the bottom left corner is where the eXtremely large rudder tube extends through the rudder shelf you can see running from side to side where the steering cylinders will be mounted. 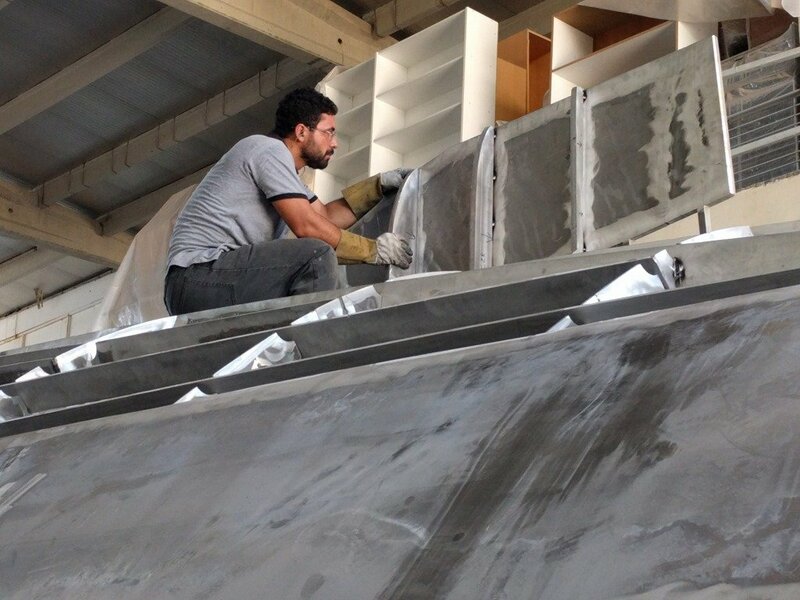 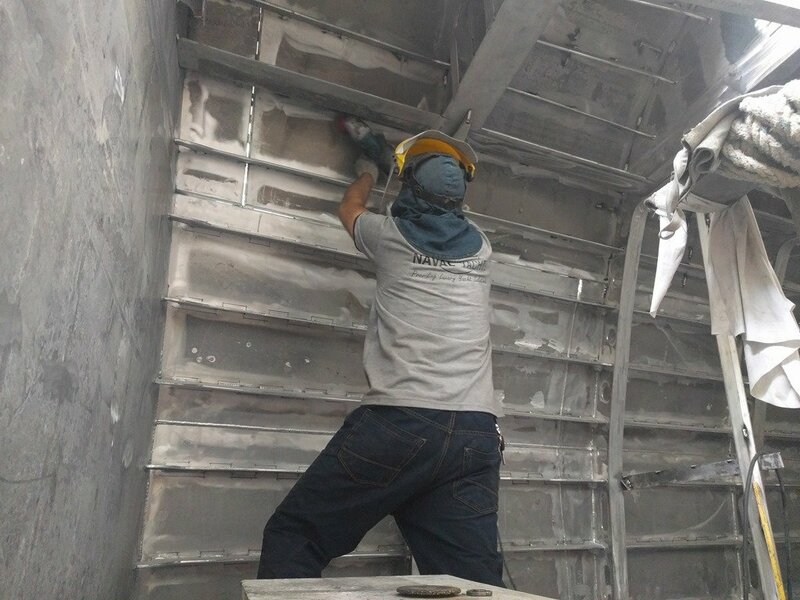 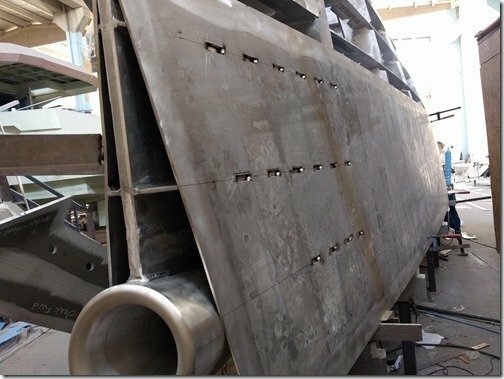 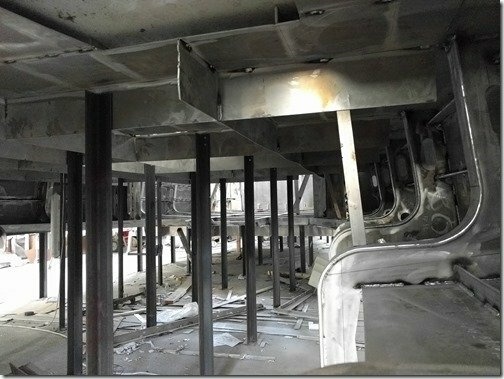 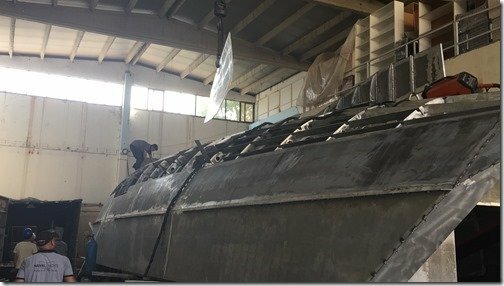 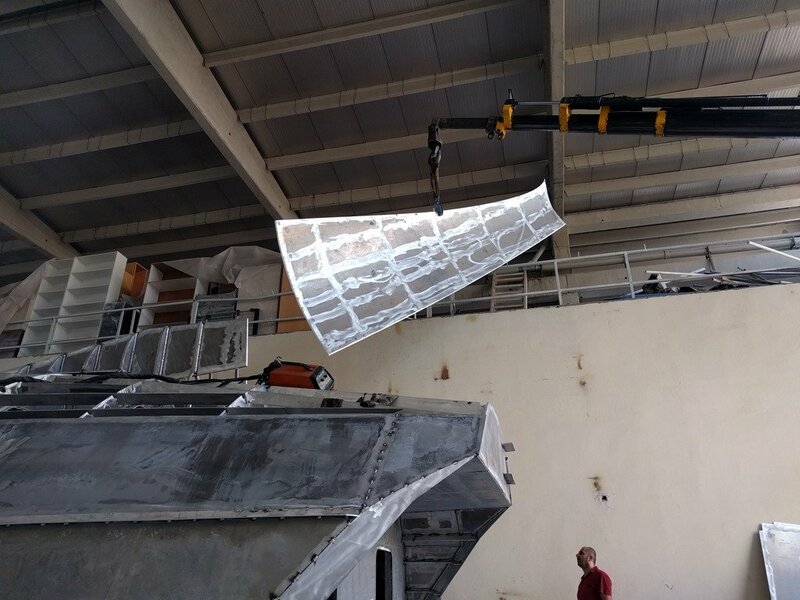 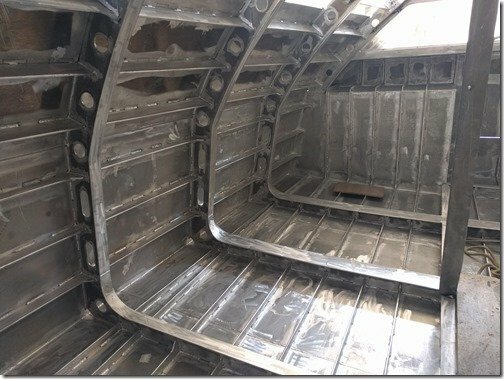 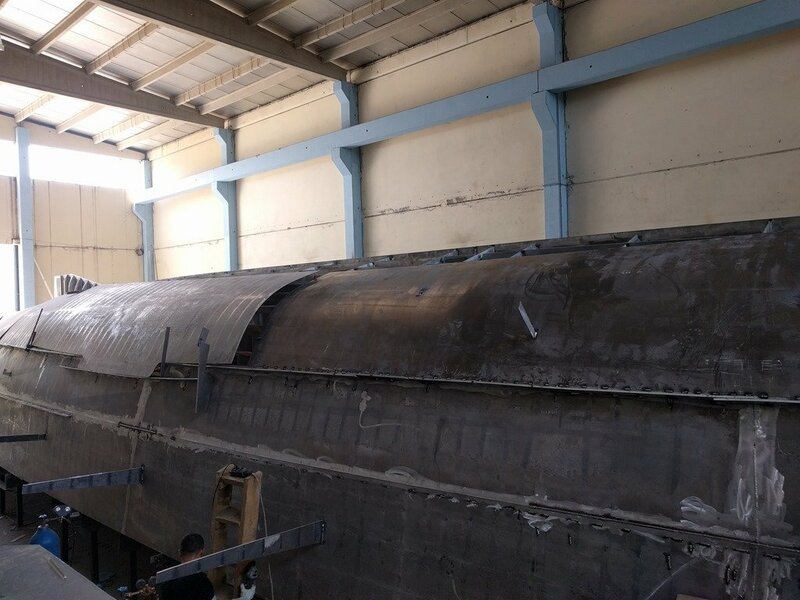 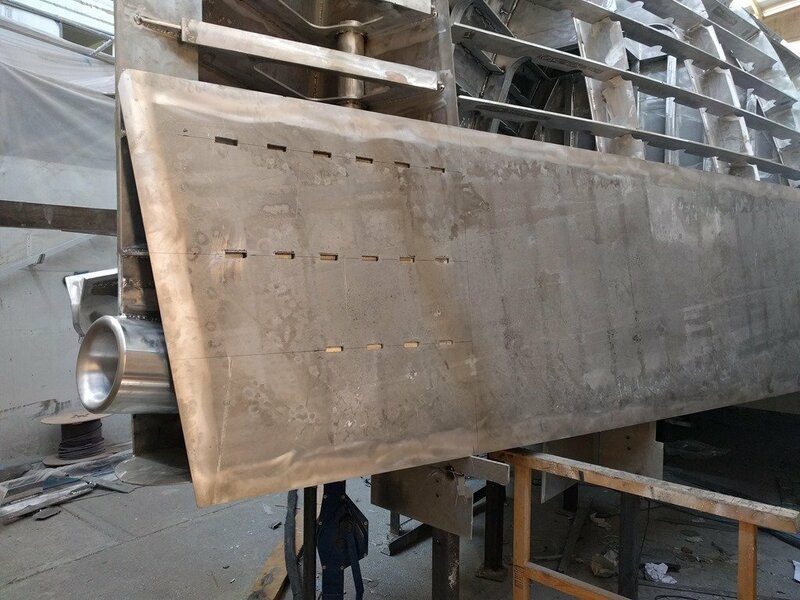 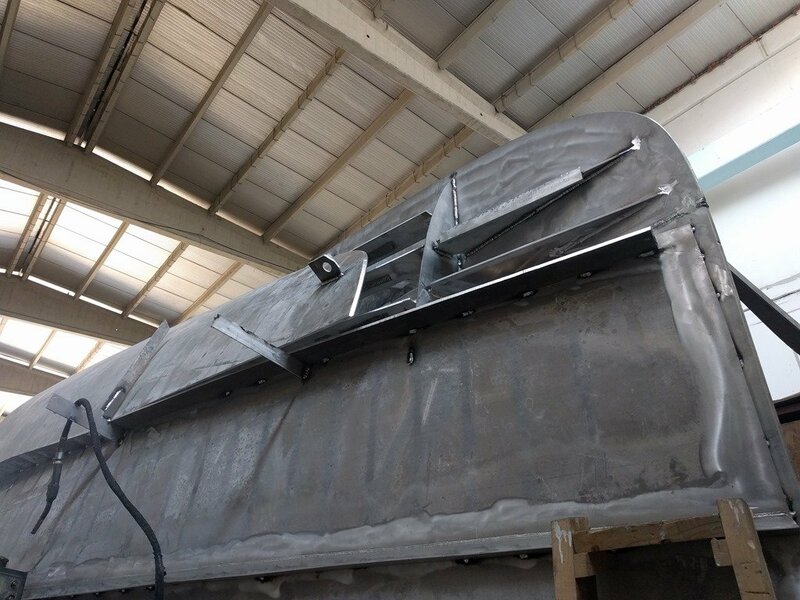 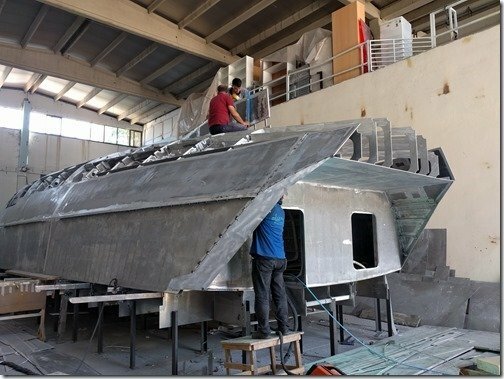 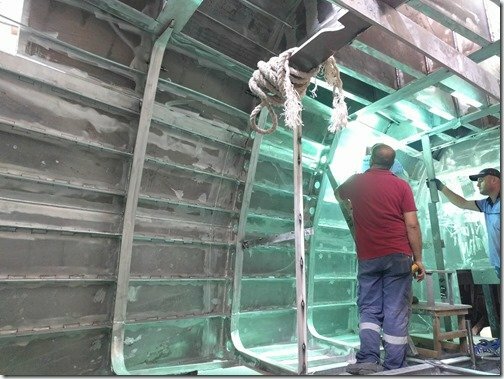 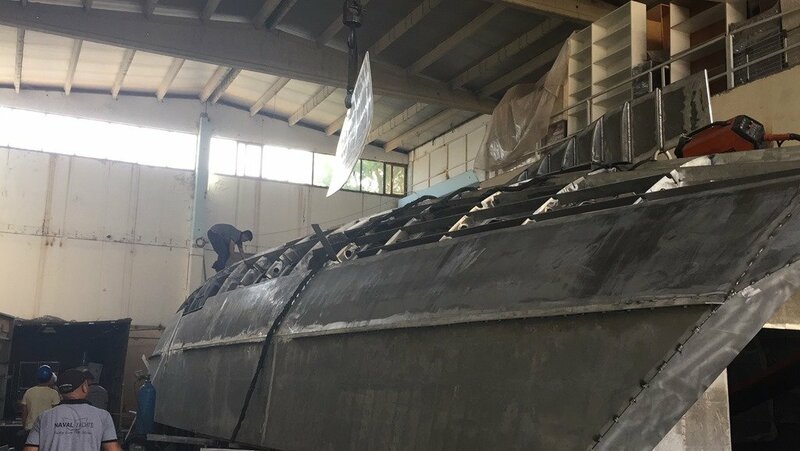 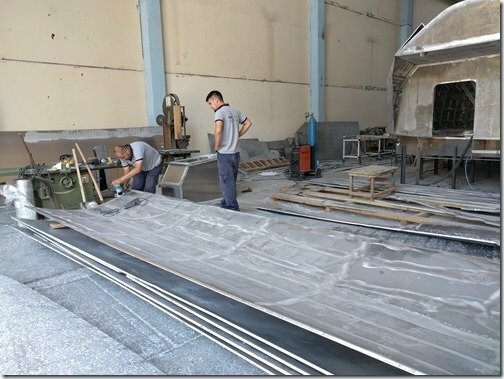 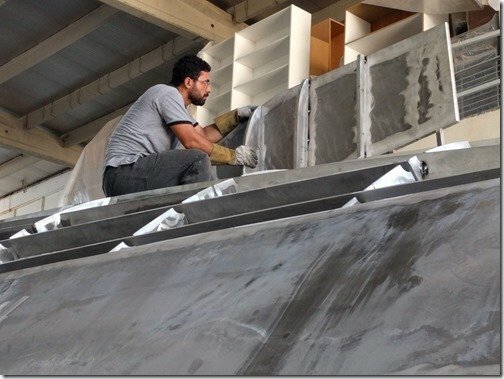 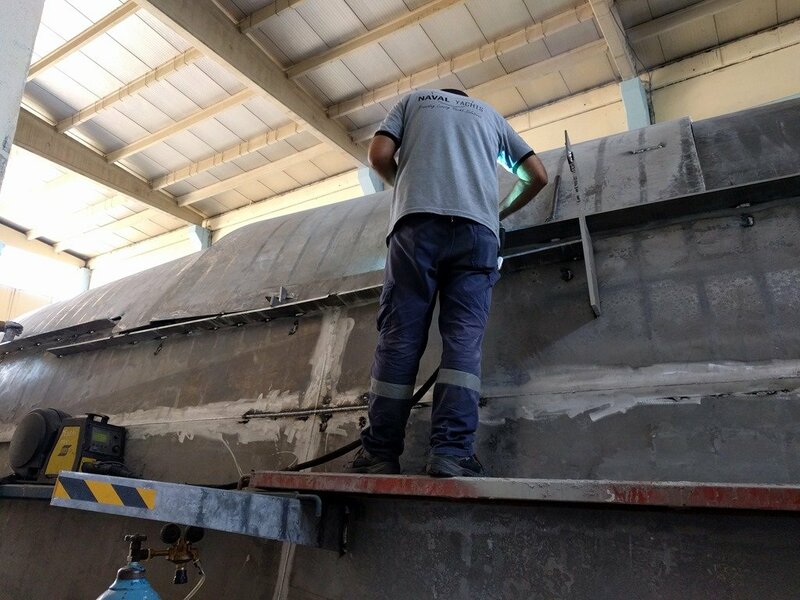 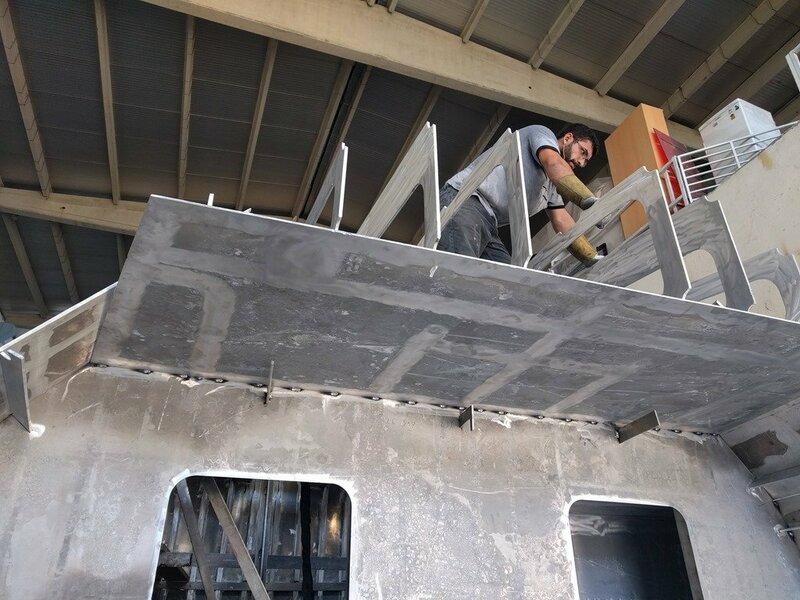 As I mentioned at the beginning of this post, we also had a new milestone this week with the first continuous welds on the exterior hull plating. 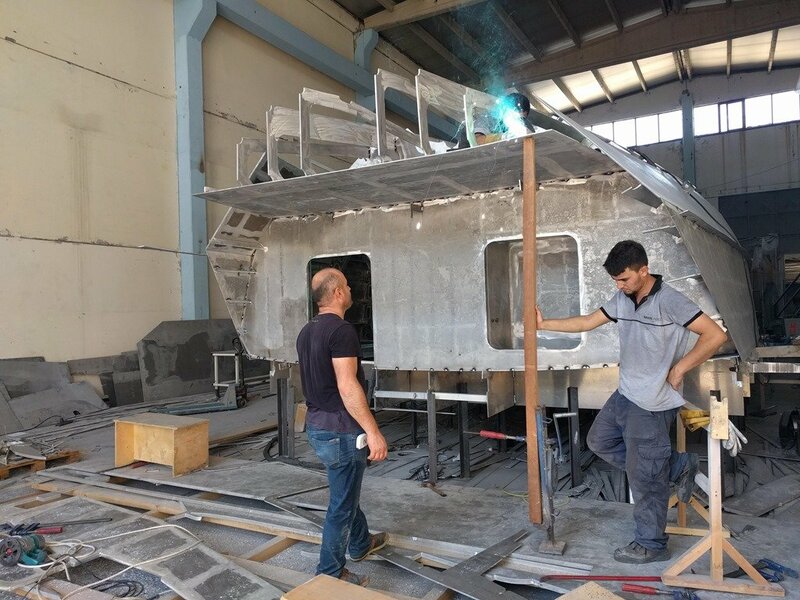 Sezgin is truly a master welder. 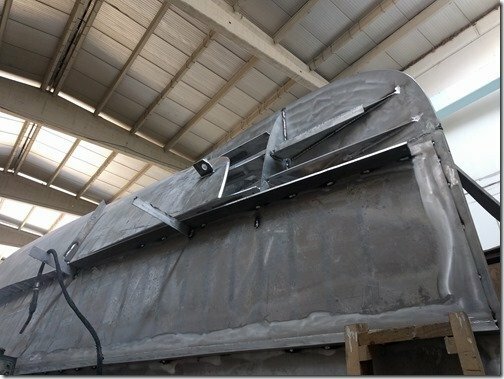 These exterior welds above the waterline will be carefully ground down flush and flat with hull plates but all other welds will be left to show off their natural beauty. 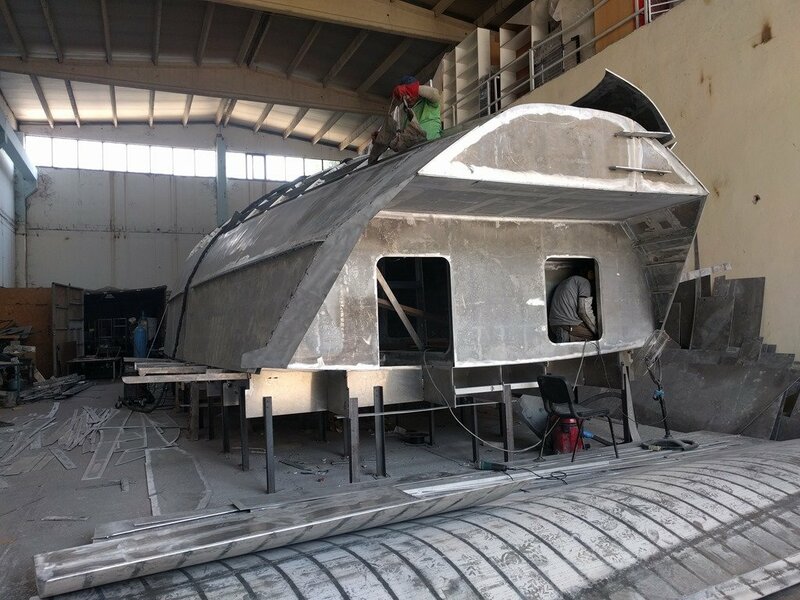 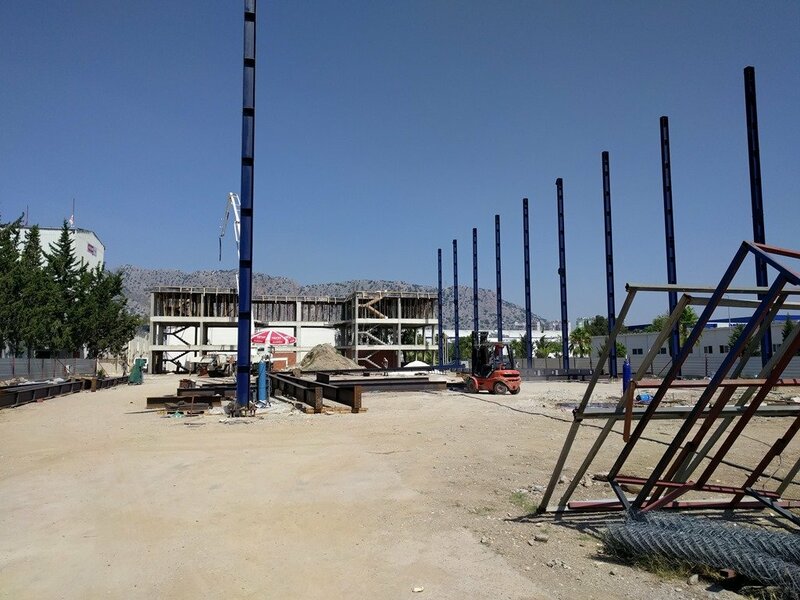 Looking ahead and while we are waiting for the 3D curved hull plates to arrive, construction of the upper super structure can begin marking another stage of construction. 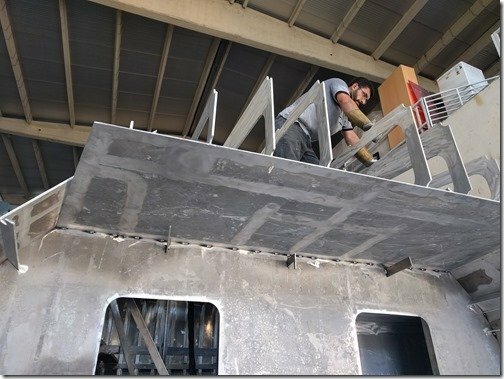 The roof section in front of the SkyBridge holds three of the 14 solar panels and the SkyBridge bimini roof will hold 8 more. 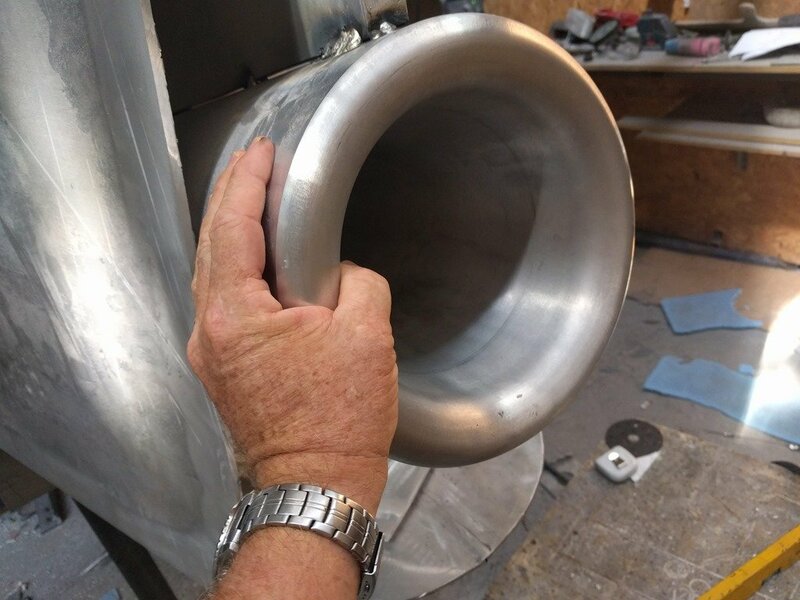 Should enable us to enjoy weeks on the hook in complete silence. These two quick renderings will show you how this looks and how the aluminium superstructure will provide the solid framework for all that window glass and form the roof and SkyBridge above. 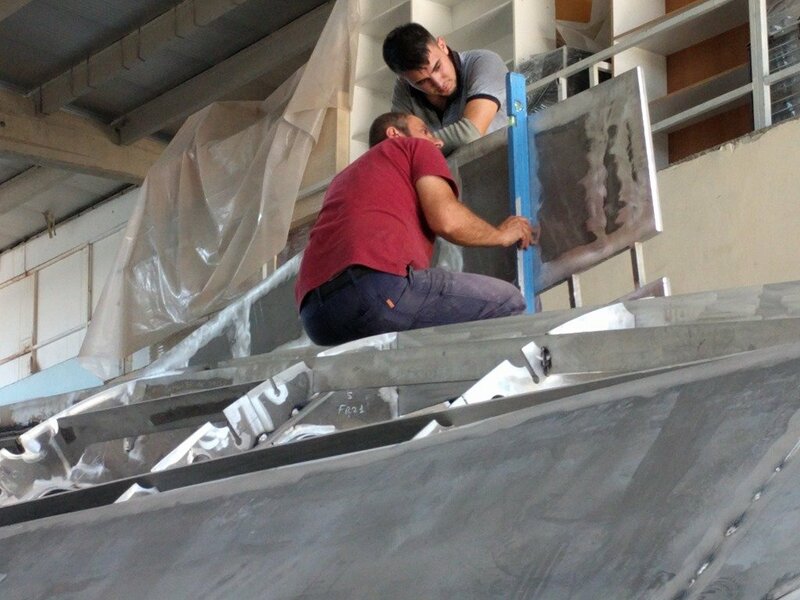 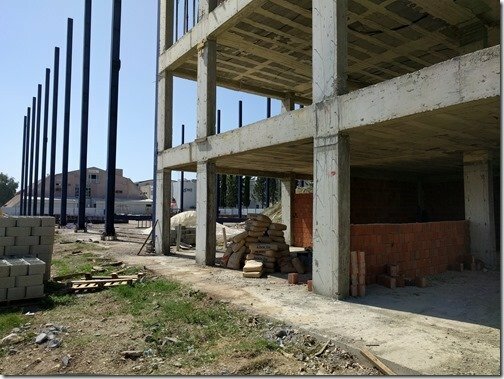 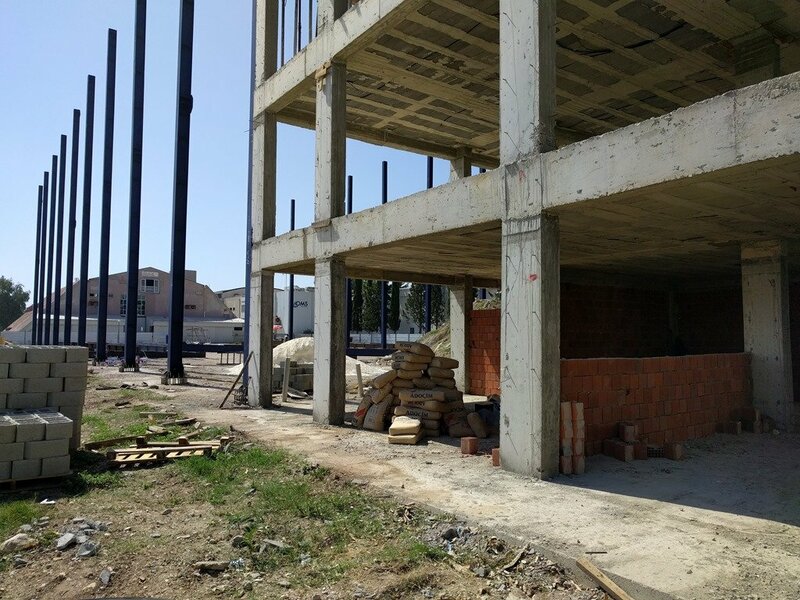 Here you see Uğur and Umit are taking together one of the upper frame pieces which will form the roof of the Pilot House.This will form the roof of the raised Pilot House with the SkyBridge on top of that. 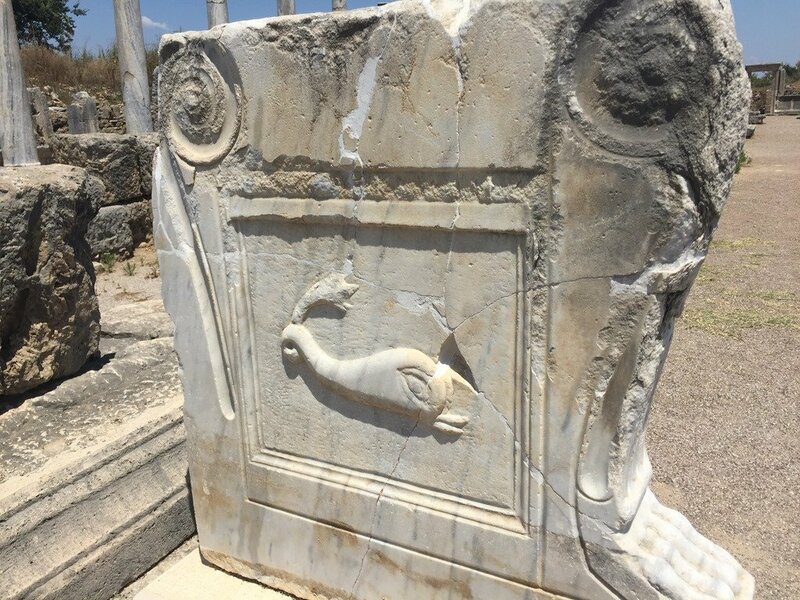 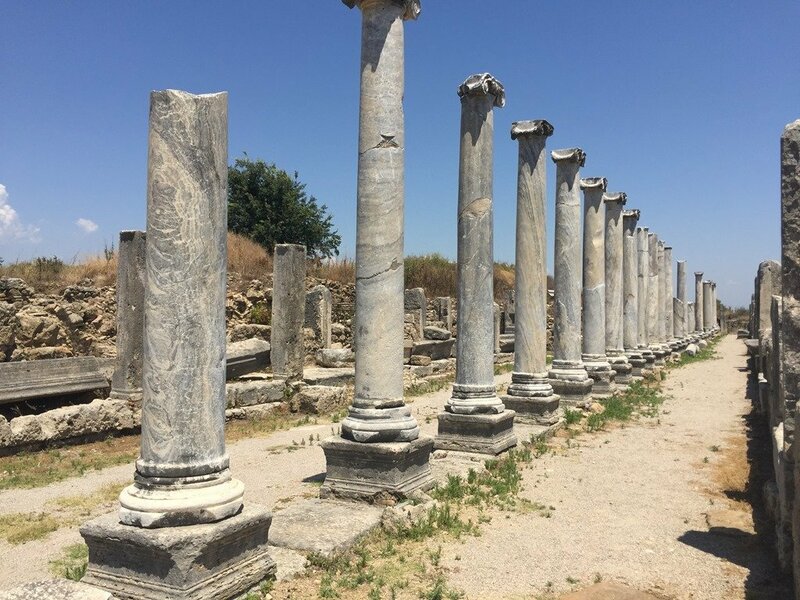 And meanwhile back in Christine’s world she had a fun trip to the ancient city that begat modern Antalya and the nearby Aspendos theatre. Two sailing friends, Chuck and Patty on sv Soulmates have been docked here in Antalya for the past 2 weeks and we’ve had several chances to spend time with them. 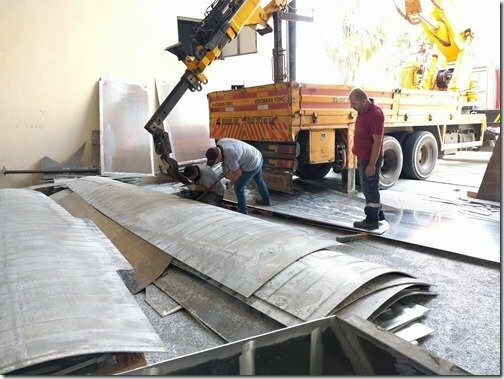 I will let the pictures speak for themselves but this will help you understand more of the reasons we chose to build Möbius in this awemazing area. 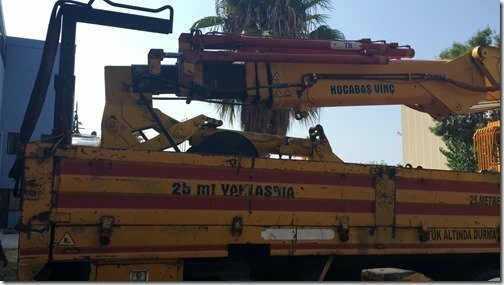 So that is the week that was July 2-6, 2018 for us. As always here is your quick video summary for this week. Thanks for joining us and be sure to leave your questions and ideas in the Comments section below.